The main carrot "dig" today! 29th August -So the trees were right in their forecast then! 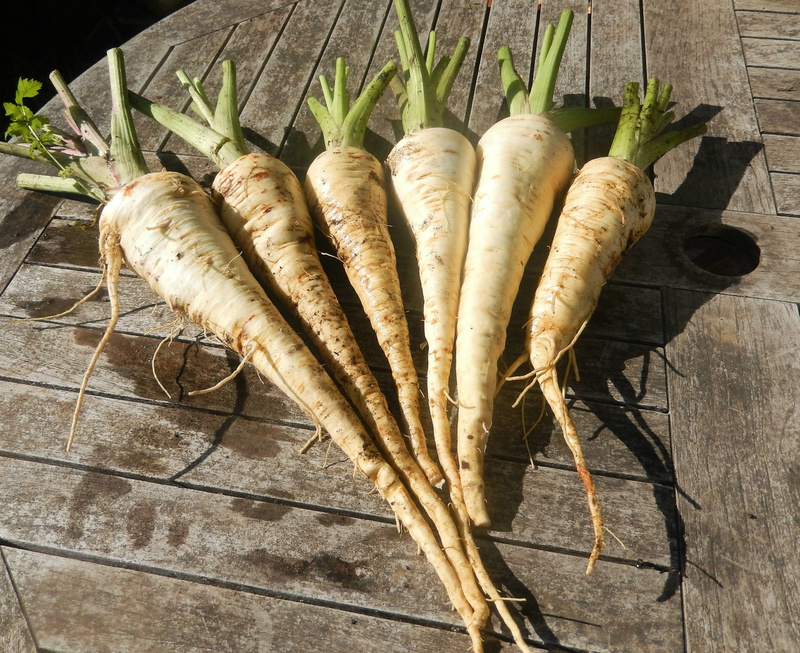 This week's harvests have had a couple of new additions, the first of which are the carrots. With our local Show looming for next weekend it was time to dig the main crop up to try and choose three matching ones .... oh hahaha! You would not credit how many carrots it takes to find three that match... all the ones in the top picture are those that did not have two partners. 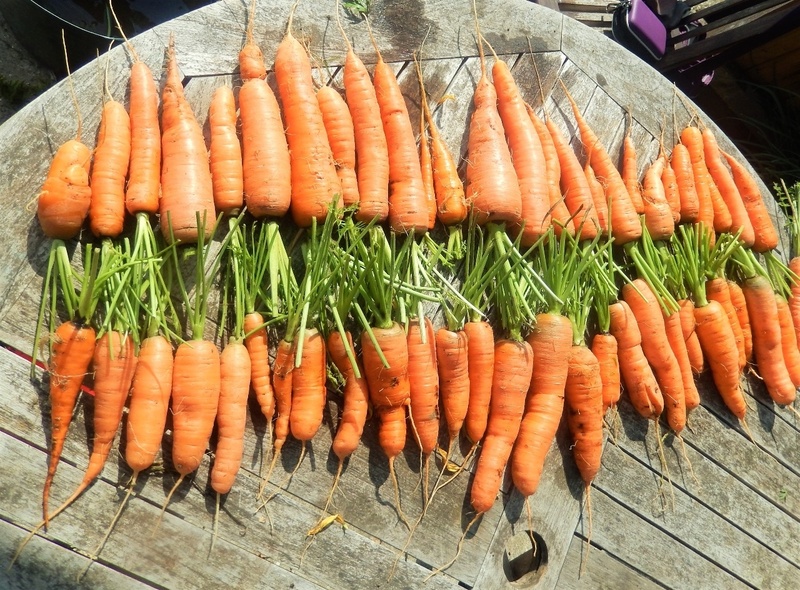 Nice carrots, but all very individual! The ones below are those sets of three we can now choose from, so at least there are some options this year, which is good! 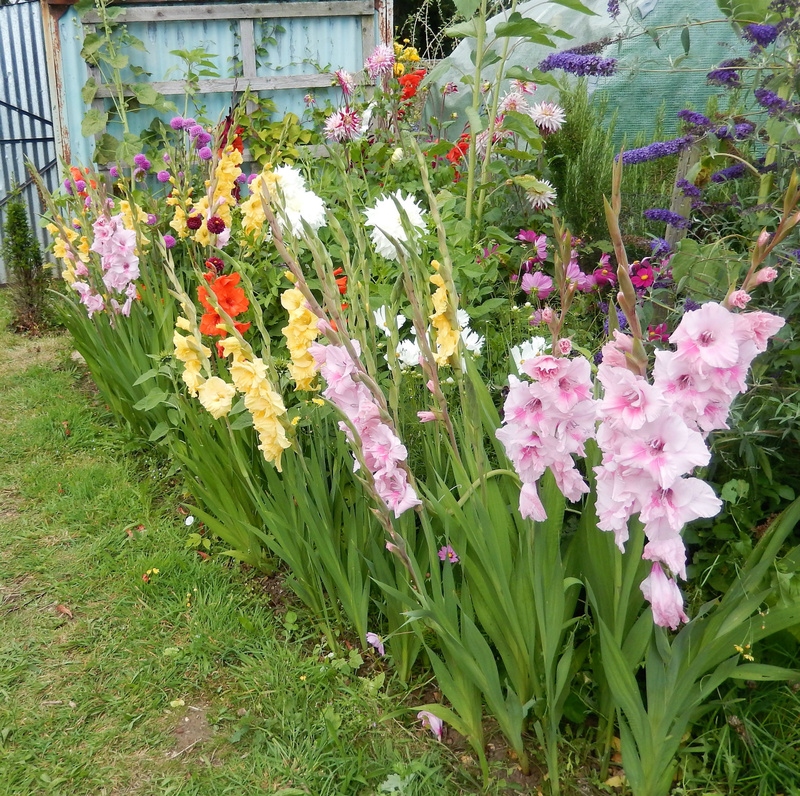 Not perfect but the best we have, which is the spirit of Gardeners' Shows as far as we are concerned. If we waited for "perfect" we would never enter anything! 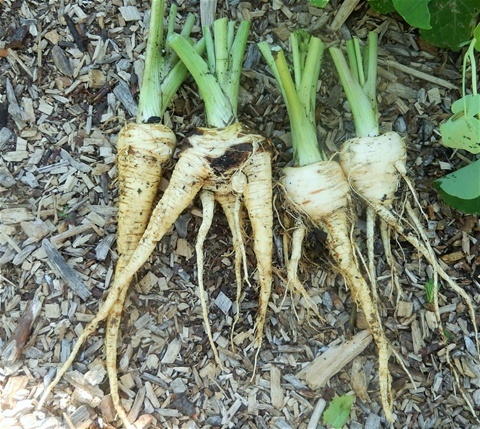 And then there were parsnips to somehow get out of the rock hard ground in one piece. Each one had to be soaked out, as digging was almost impossible, and I was worried about damaging the roots. Only needed three to exhibit, but after the saga of the carrots I was worried I might be there for hours, but things went really well and the first two were great..... and then, downhill after that. The fanged beasts started to appear!!! Eventually I managed to excavate a couple more that will scrub up well enough, even though they have some orangey canker spots. The two nice white ones have had a good wash, but then I managed to burst a burn blister on my thumb and didn't fancy putting my hand in muddy water, so the others will have to wait for their bath and trim up. 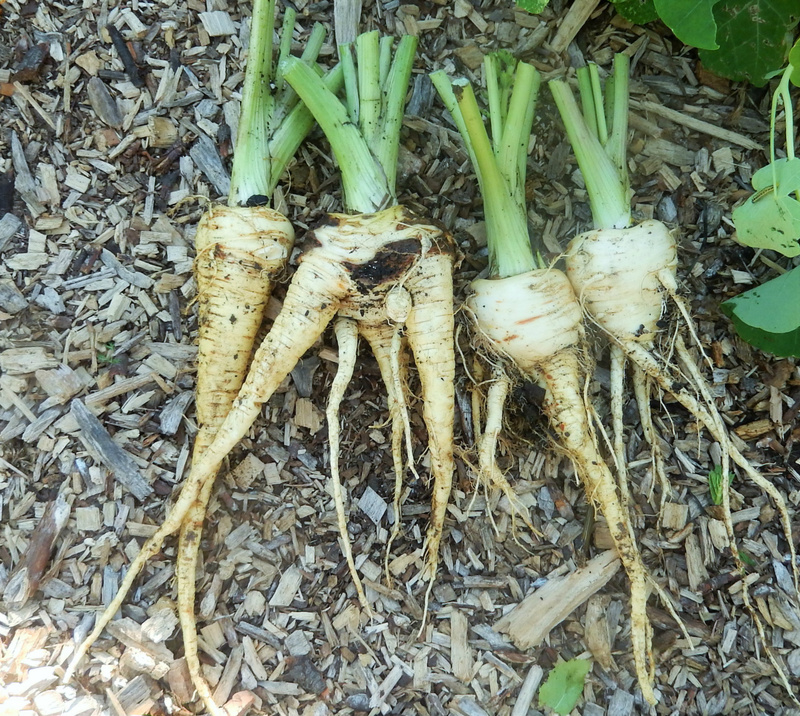 Parsnips are easily confused while they are growing! These are the ones you never see in the shops, but us GYO-ers can despair of! Fanged roots can be caused by the tap root being diverted off track in its early growth stages, by transplanting seedlings, by the roots touching stones as they grow, by the soil being too rich soil and confusing them about which way to grow, poor little things! And then there is sheer cussedness, beacuse despite these being sown directly. 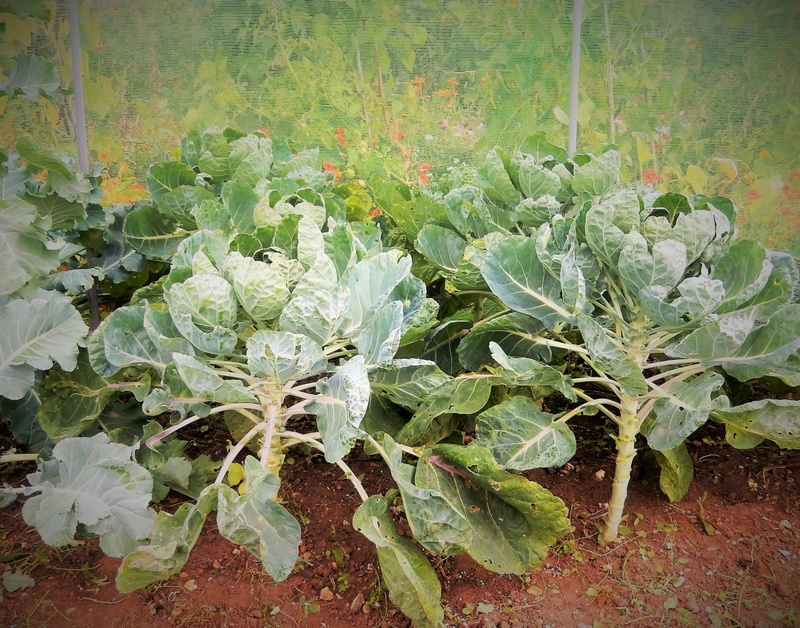 in virtually stone free soil with no manure added... they still grew into little monsters! At least they can eaten after a good scrub, usually as soup in our house. 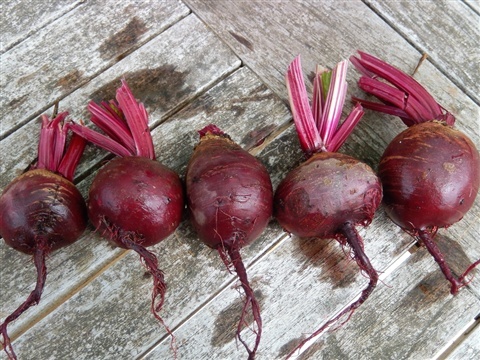 Last winter we stored all our carrots and beetroot in a large box of just damp compost, in the garage where it was cold and dark, and they lasted in excellent condition right through until Springtime, so all those surplus to immediate requirements will be packed away safely. 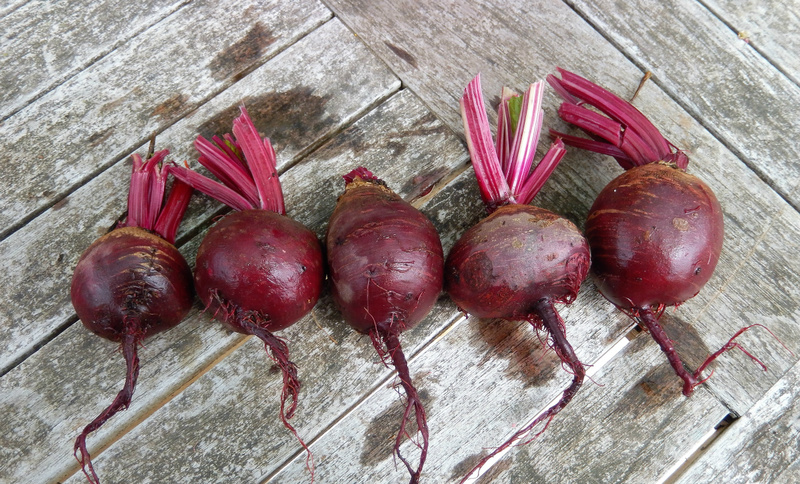 I did also pull up a couple of kilos of beetroot to settle on three to show, but my camera decided to stop working at that point so there is no photo of them, sorry. 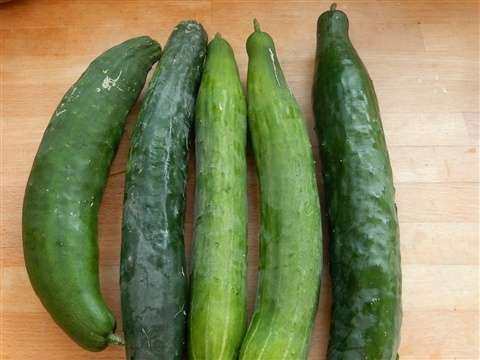 Cucumbers are still growng away in the greenhouse, even though their leaves are looking decidedly sorry for themselves. I harvested another 3kg this week, and they are already in jars as sweet dill pickles. These can be eaten within a day or two of being made and taste just gorgeous with the dill flowers giving them an almost perfumed flavour somehow. 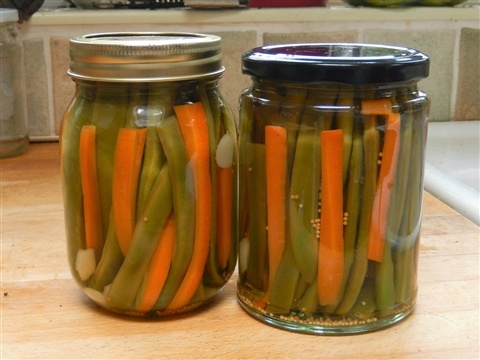 There are still several growing, so if the are not eaten in salads they will also be ending their days in jars too, for us to enjoy until next year's fresh ones arrive. 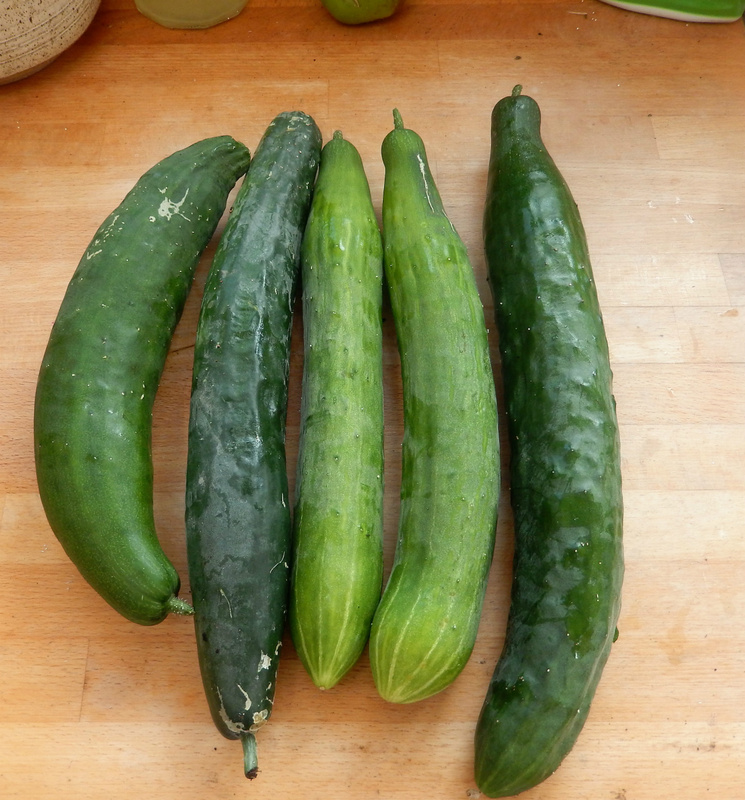 I also picked the outdoor cucumbers - Marketmore - and had six good sized ones from a single plant, which I was happy with. 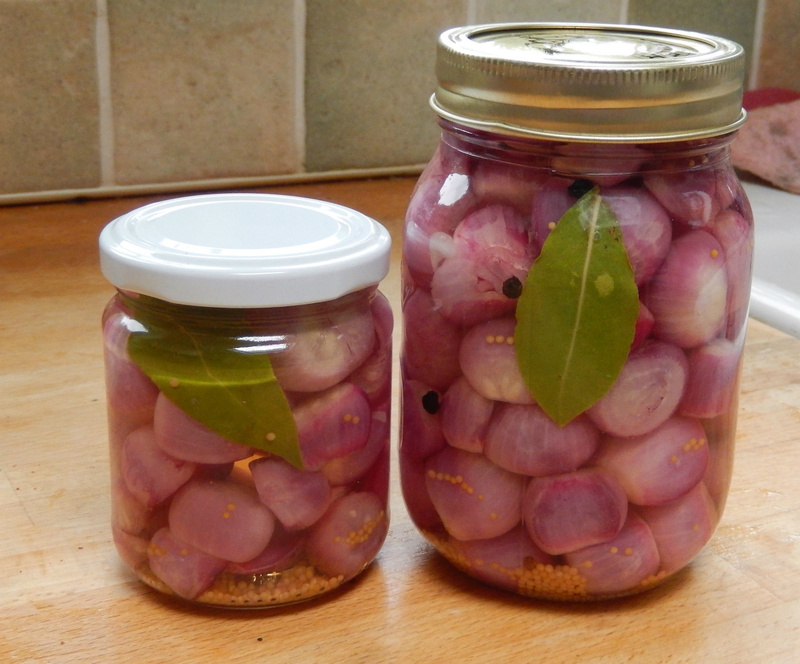 These went with the last of the gherkins in a pickle. 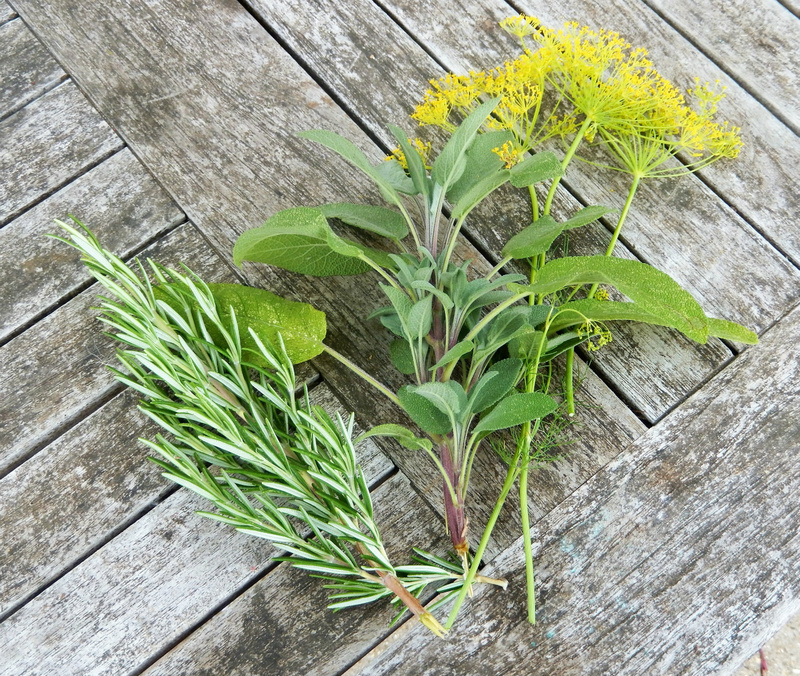 The main herb harvested this week has been Dill of course. 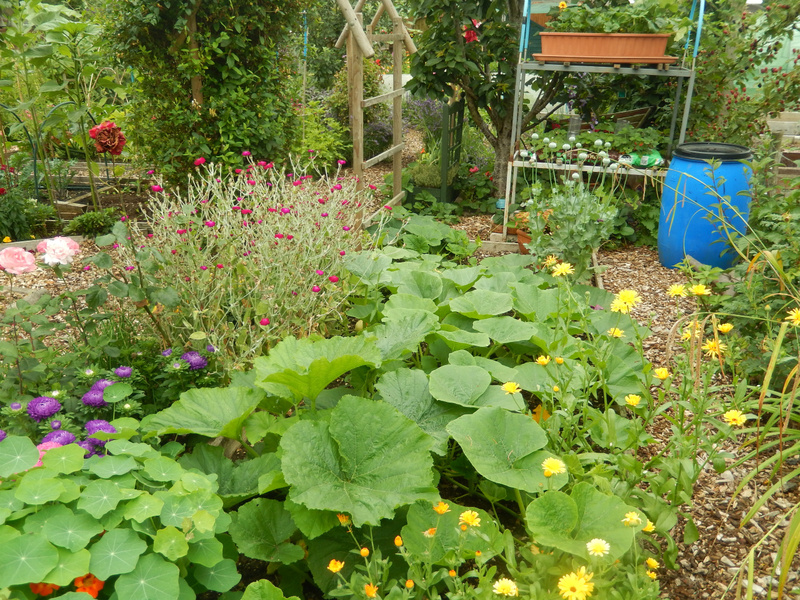 One short row was all I sowed, and it has provided us with more than enough green foliage, and wonderful flowers to use in the pickles. The rest are now setting seed, which I shall leave to dry and keep to use throughout the Winter. Some vegetables continue to figure in our weekly harvest in large quantities; Runner beans and patty pan squashes are two, so this week I made a double size batch of piccalilli, with some nasturtium seeds added. It needs to mature for a few weeks before it will be ready to eat, but a quick preliminary taste was promising. 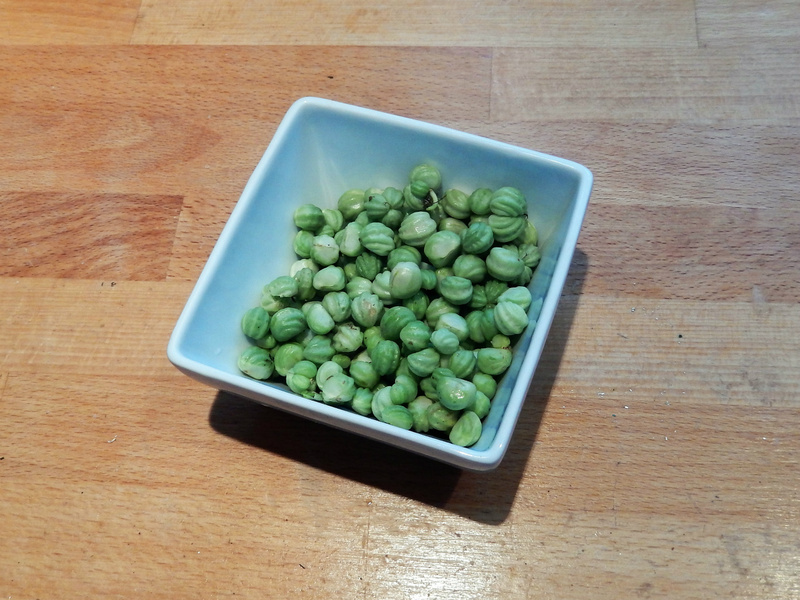 I made a mistake with the first lot of nasturtium seeds, by leaving them in brine for two days, and they started to ferment and smelled absolutely vile!! I think it may have been the warm weather, but next time I shall only be leaving them overnight for sure! The blackberries are turning into a bumper crop. This week's has been turned into cordial and blackberry gin. 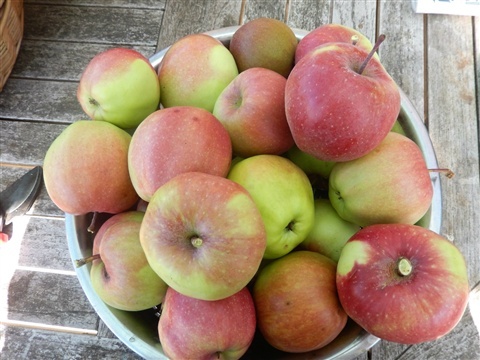 Eating apples from the trees in the garden, and cooking apples from the plot are ready to pick. 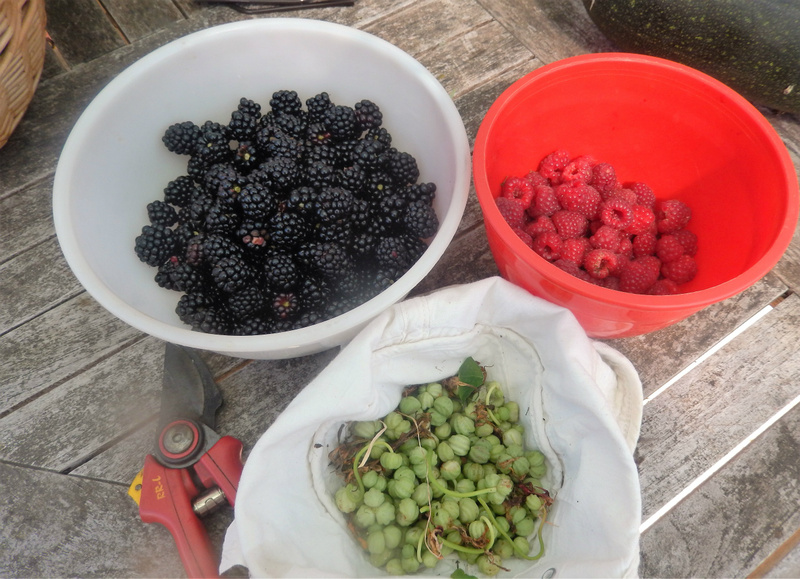 Blackberry & Apple jam is on the cards for this week! 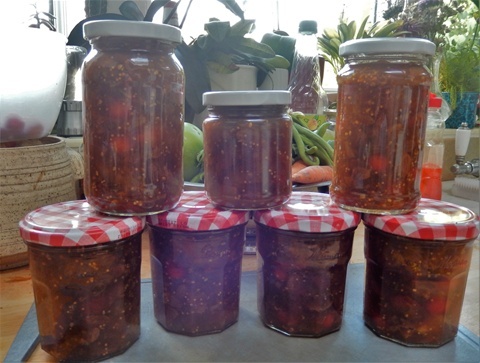 With this amount of tomatoes virtually daily, I have been trying to come up with ways of using them ... Chocolate Cherry & Chilli Chutney this week!! Sadly rats enjoyed our largest red tomatoes before we did. 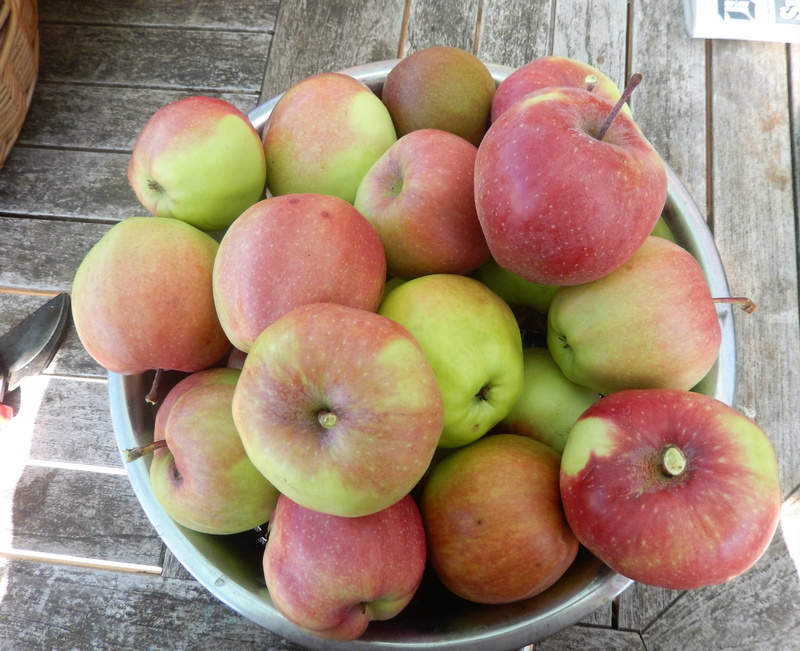 I now cut whole trusses of almost ripe fruit and bring them home to finish ripening in boxes in the kitchen. Seems to be working so far. 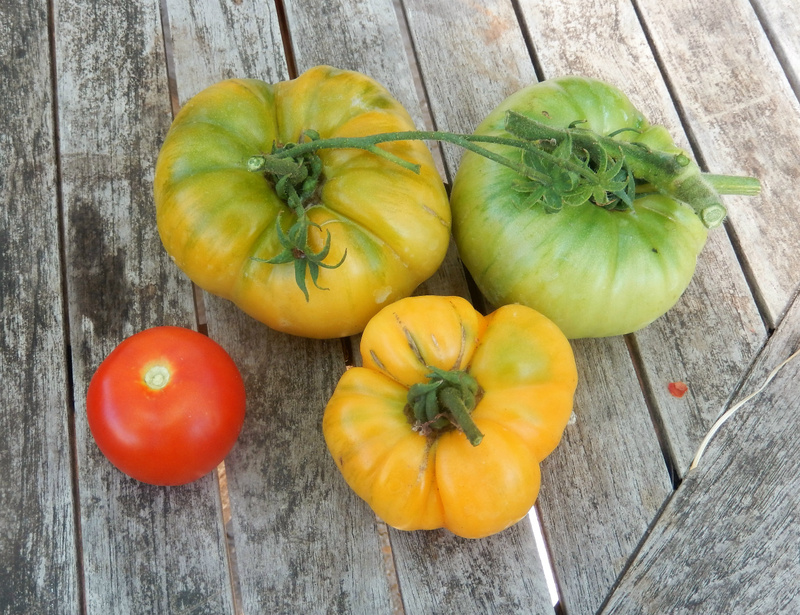 These large orange tomatoes are Summer Cider, with a Moneymaker for size comparison. 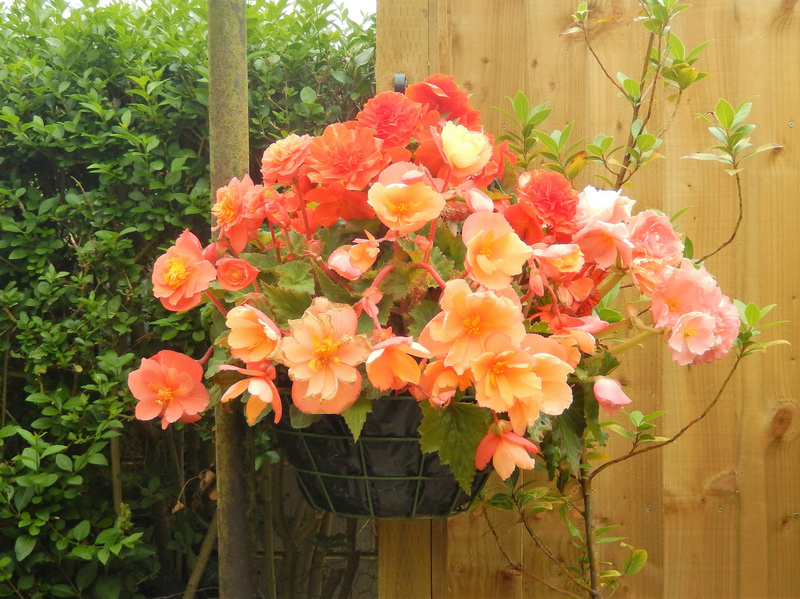 They have ripened fully and are now deep apricot in colour. 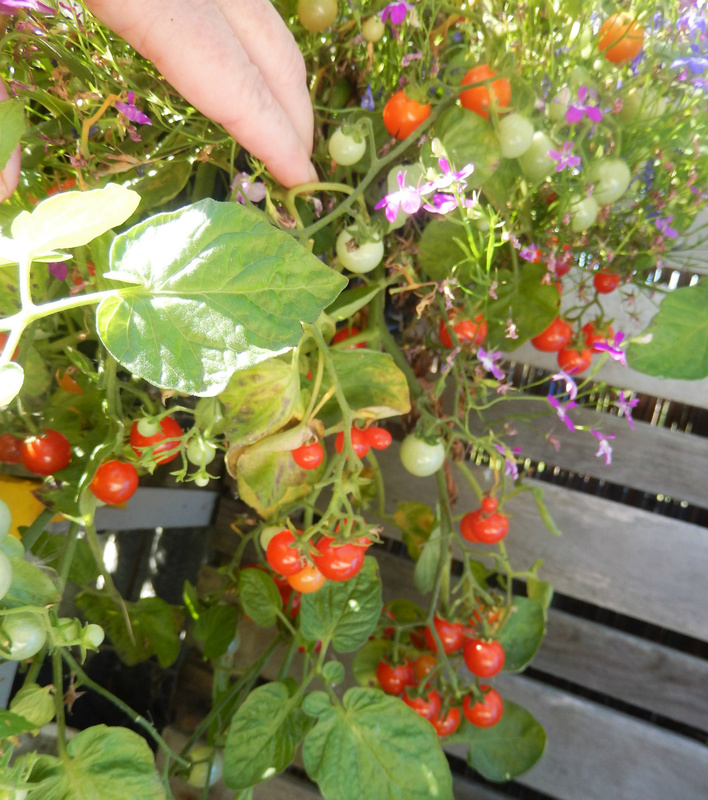 If anyone ever doubts whether it is worth growing tomatoes in a hanging basket, just look at this 100s & 1000s plant. It is smothered in fruit, that we mainly eat in passing! 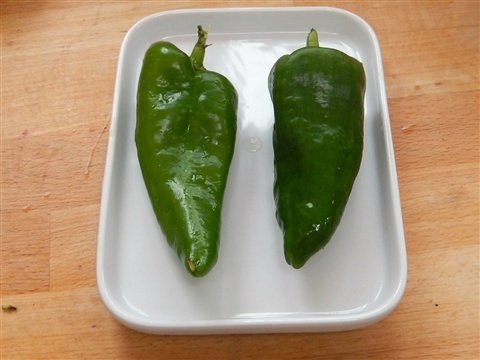 Another first this week has been green chillies. Our son's mother-in-law gave me some Bangalore Torpedo seeds for Christmas, and as you can see they have done well! 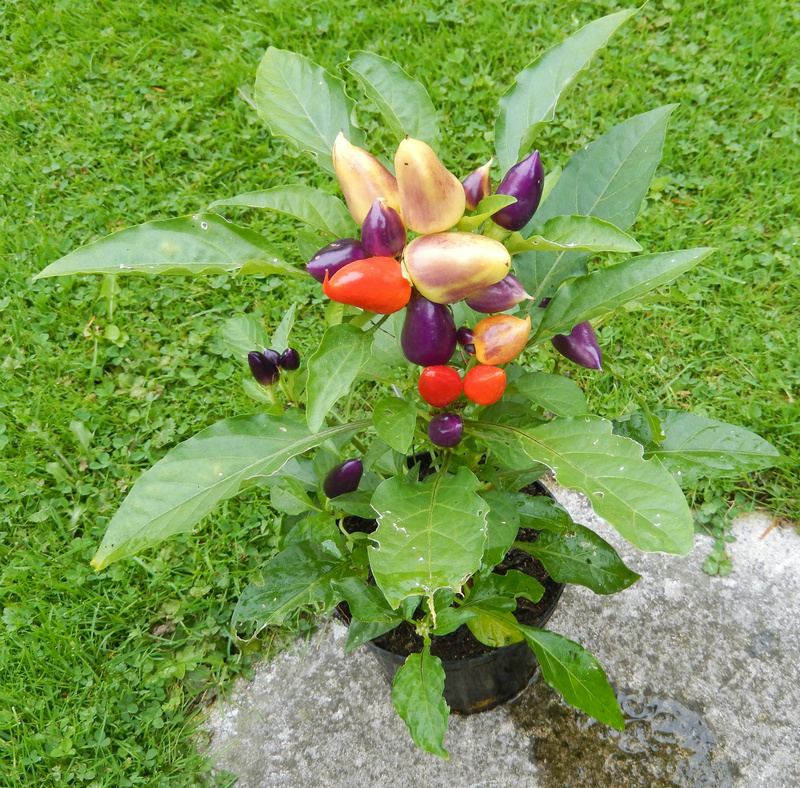 This plant is on a bench alongside our shed on #146 where it enoys the extra shelter.The chillies will be even hotter when hey are ripe, they have a decent bite while they are green. A nice addition to chutneys! Thank you, Jean!! 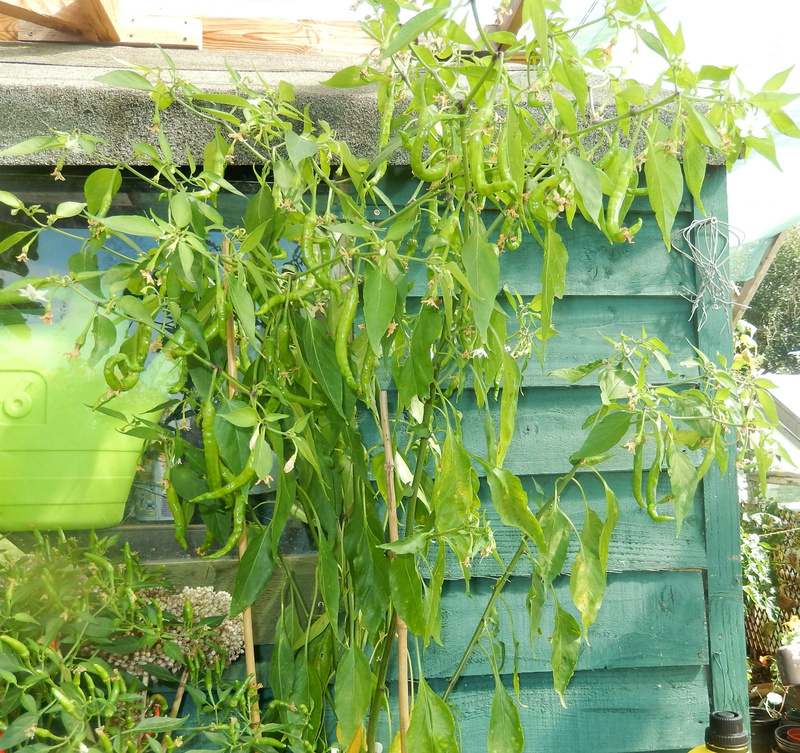 The smaller plant to the left is Little Elf, a reliable cropper that is smothered with small, upright chillies for months. 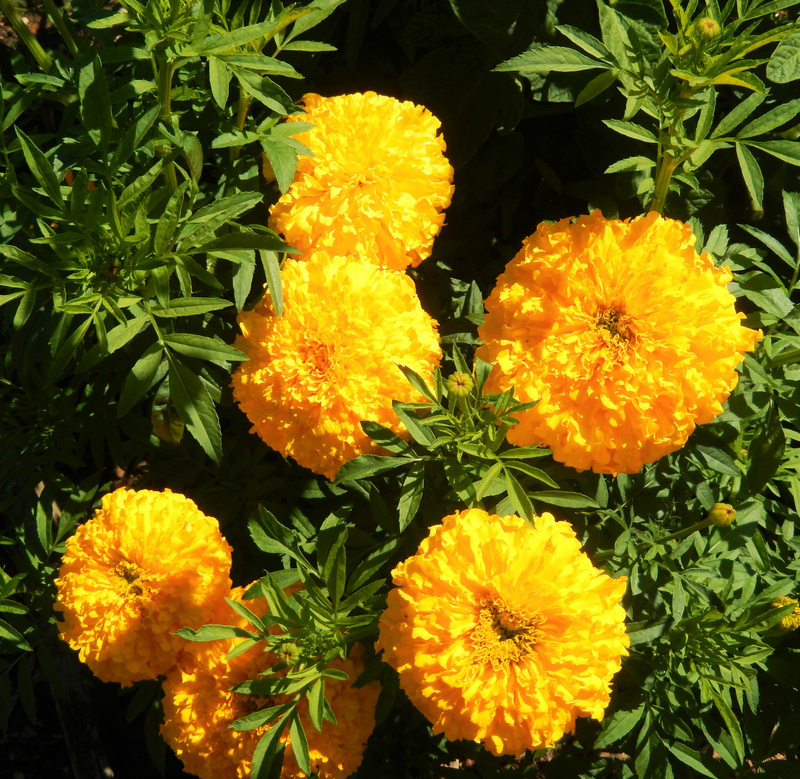 We grow this every year, and have several plants in the garden at home as they are very decorative. 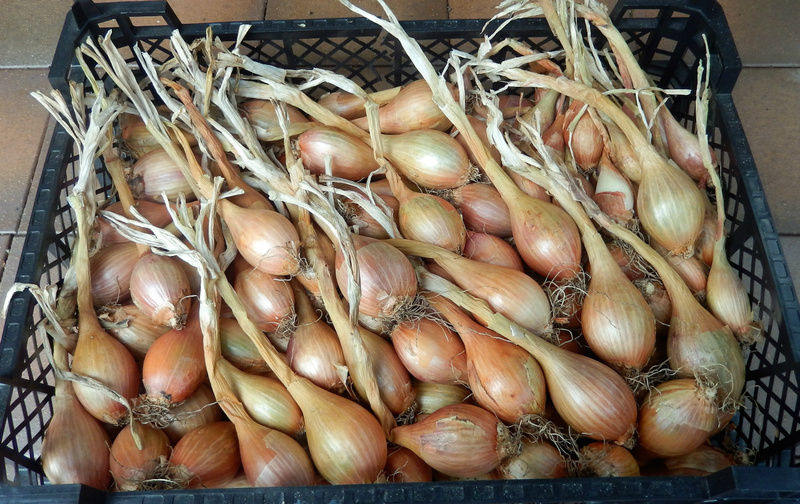 This week has been mainly about harvests and preparing these for storage. 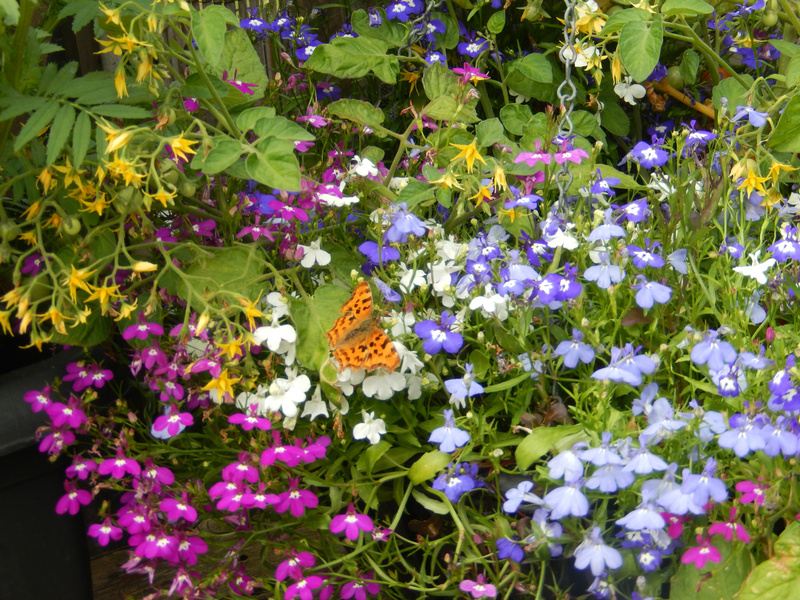 There is a kind of lull in planting and sowing for a week or two once more. It does not happen often in the year, but the extra time is very welcome with that huge amount to deal with in the kitchen! 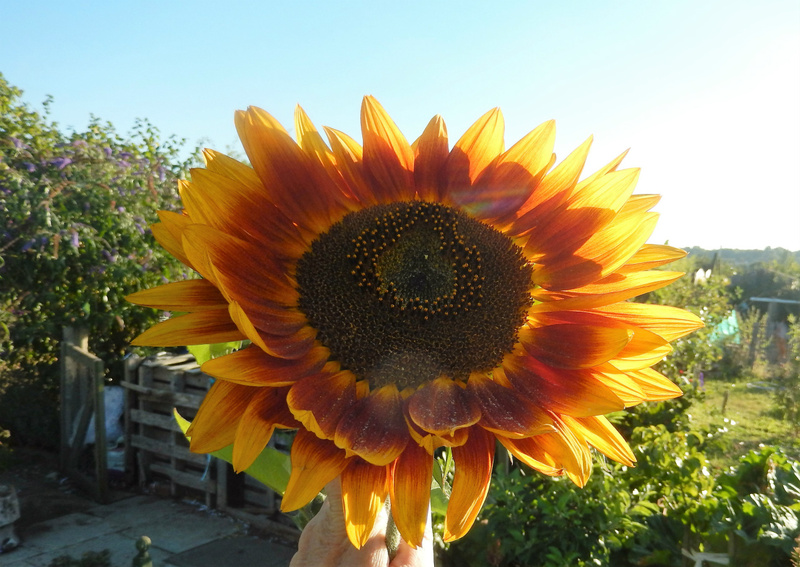 We are still harvesting cut flowers:this one of our taller sunflowers, the side flowers of which last for ages in water. Thank you for reading this blog!! 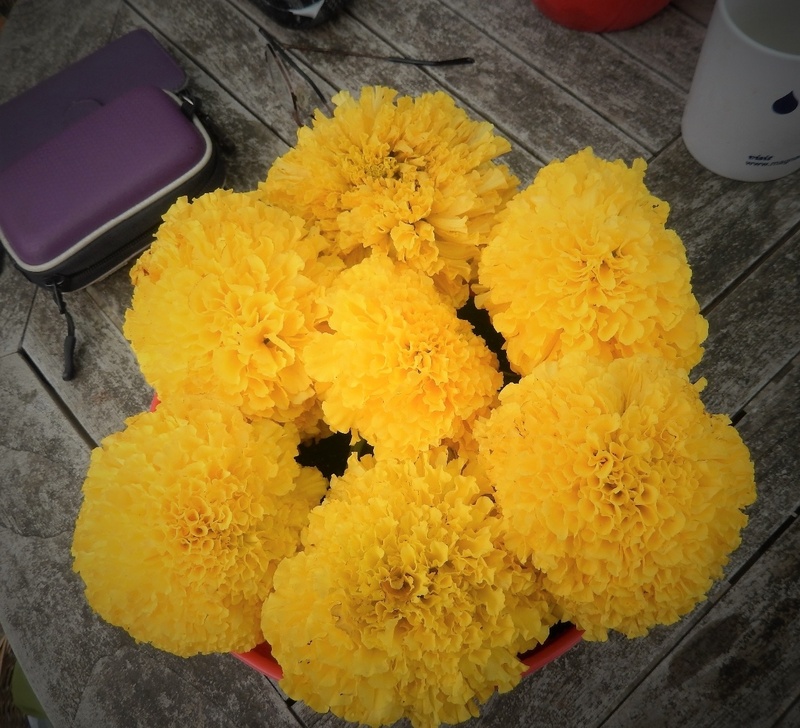 The Indian Marigold flower heads are huge! 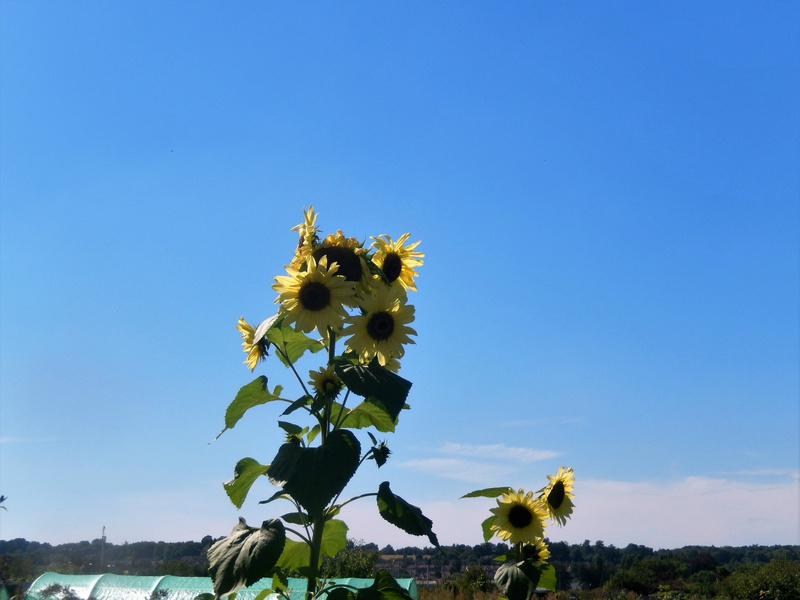 22nd August - We actually had some rain this week! 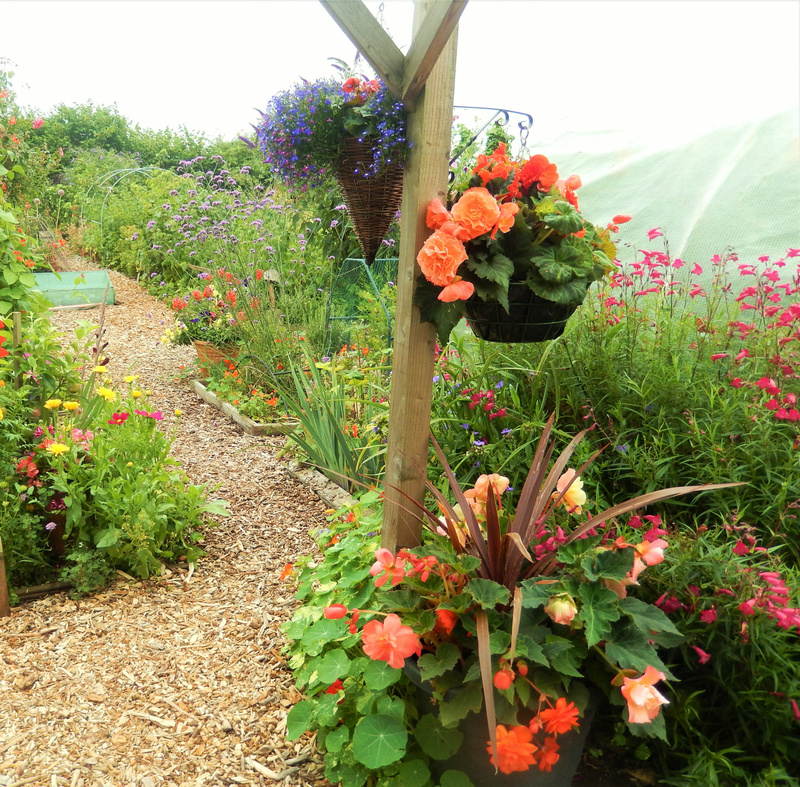 It has been really good not to need to spend quite so many hours watering everything this week, especially when there is so much to harvest and increasing numbers of plants that are passing their best and needing to be cleared away, either for further crops or for the soil to have a rest. 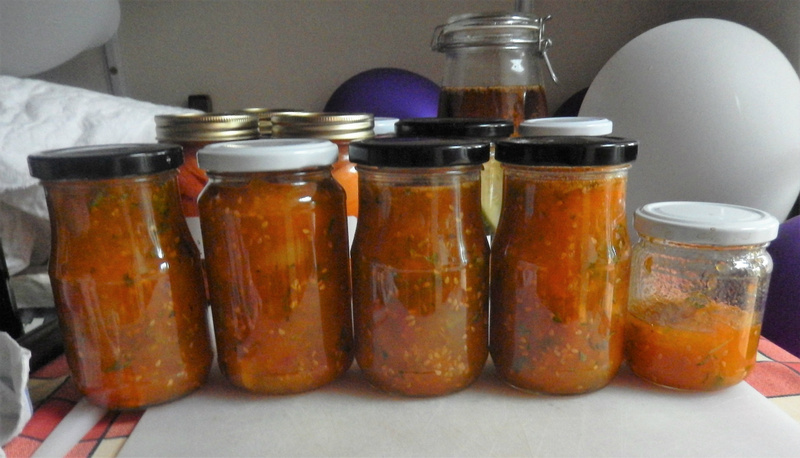 Another busy week in the kitchen too, with jars lined up on the table awaiting their labels. Then of course there is the installation of the wooden edges to the beds on #145 ... two completed and one almost done. This is going to make the management of that plot much easier next year, especially when the paths are covered with landscape membrane. Here is a selection of our harvests this week... 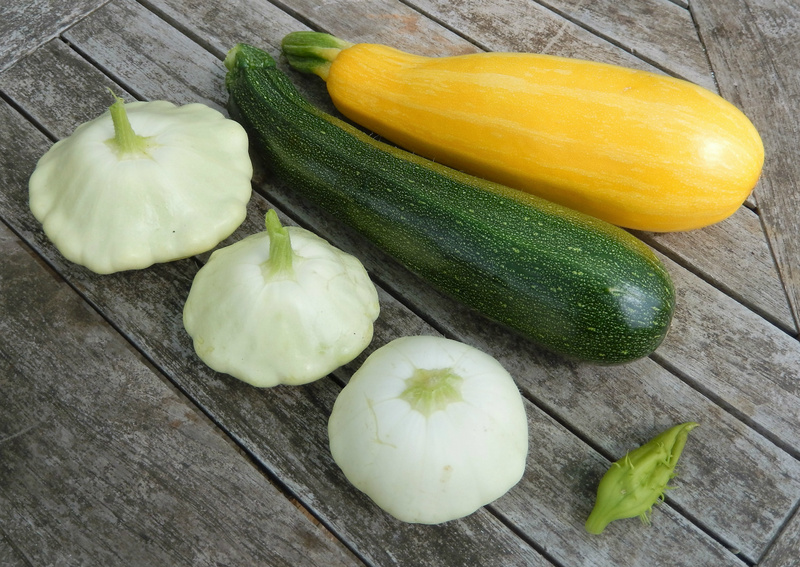 Harvest Monday ... with a round up of the winter squashes. 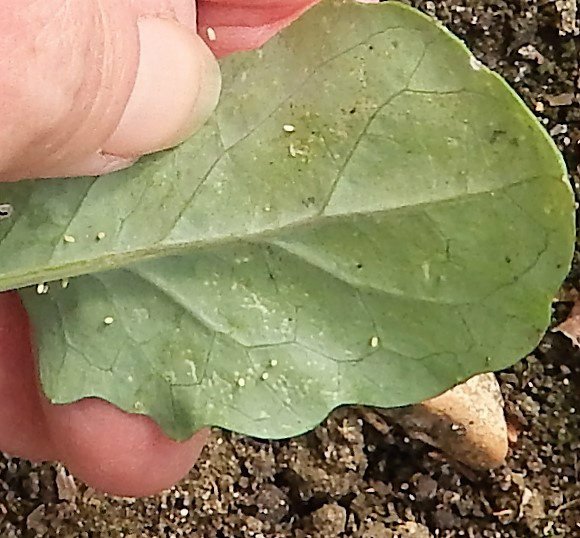 They got off to such a poor start this year with the sciarid fly maggot damage and the weather, but amazingly the second sowings have come through and harvests are beginning, albeit usually single fruit per plant. Better than none!! There are some still growing, but these two have had to come home with me already, for their own good. 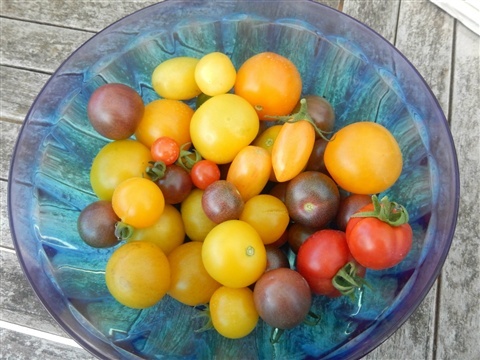 The Uchiki Kuri fruits are not going to expand further now, and so I have brought them home to continue to ripen in the garden, just in case the rats or rabbit decide the look too good to ignore! There are only four from three plants, but pleased to have even this small number. This big fat one is either Kakai or Lady Godiva. 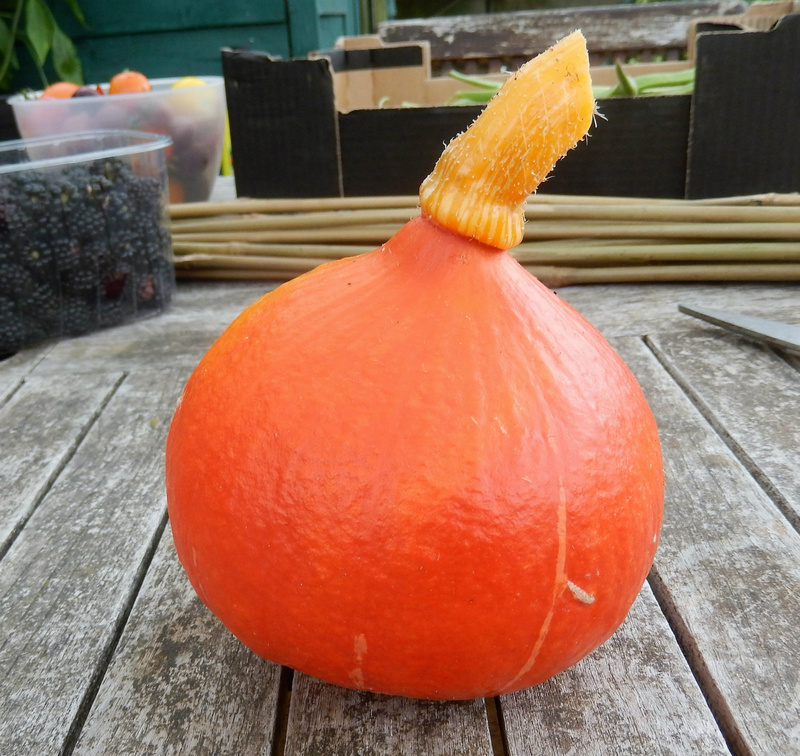 As it ripens further its colour will change and it'll be easier to identify. I was in such a hurry to get these plants in the ground I misplaced the labels, which was very silly. Either will have naked seeds though, so I shall be equally pleased whichever it is. 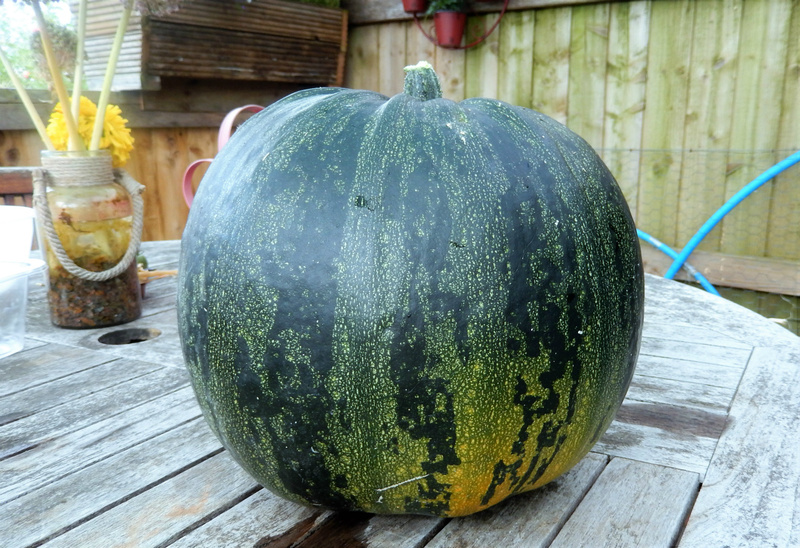 The second fruit on the plant had rotted, the stem of this one was starting to dry and it came away from the plant very easily... so home it came to finish ripening! There is just the one of these, so I shall be looking after it very carefully! Pale Green Tint.. no idea where the yellow variety went! 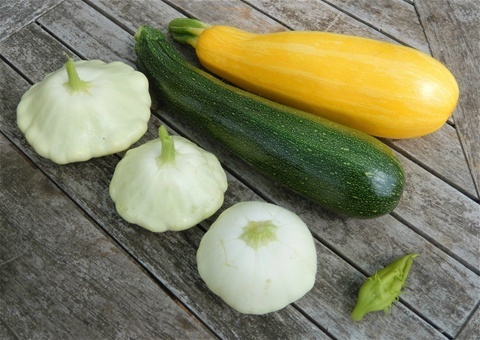 And then there are these: patty pan summer squashes. 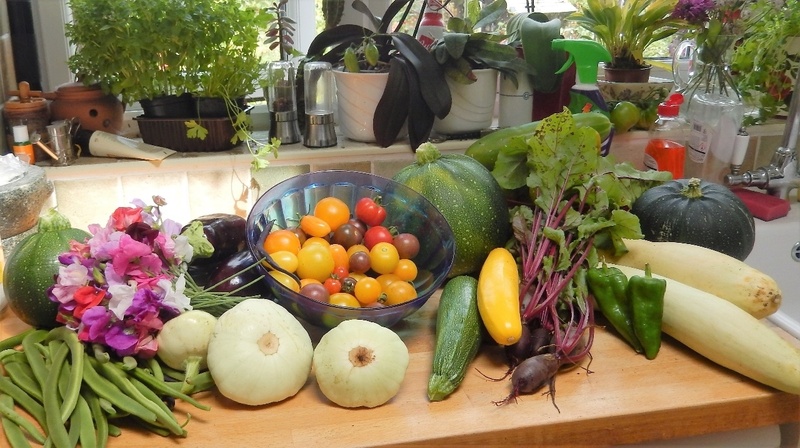 Two plants are almost overwhelming us with their generosity: these in the photo are only half of this week's bounty. Fortunately our son-in-law was keen to make chutney, so a few went to him, and several friends have discovered these are very tasty stuffed. Now what can I do with next week's harvest, I wonder? 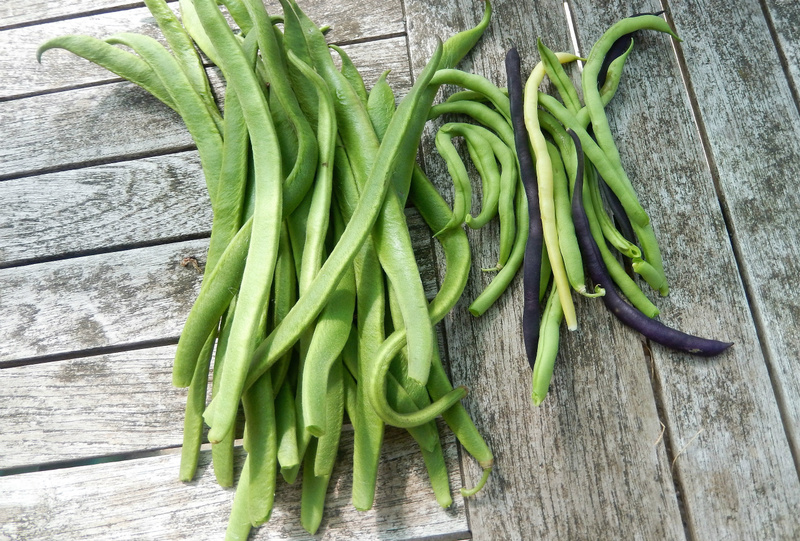 Moving on to beans ... the french bean plants are still giving us a handful or two a week, and look at what we are getting from 30 runner bean plants. Certainly plenty to share! 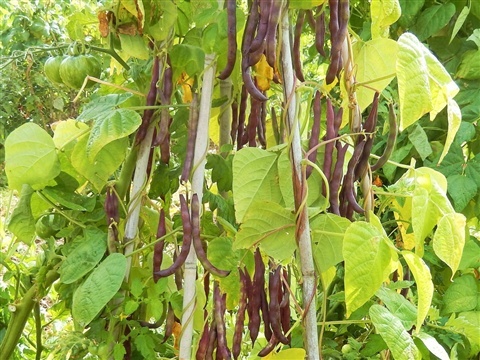 I try to pick the runner beans daily as then plants continue to flower. This is just one day's harvest! 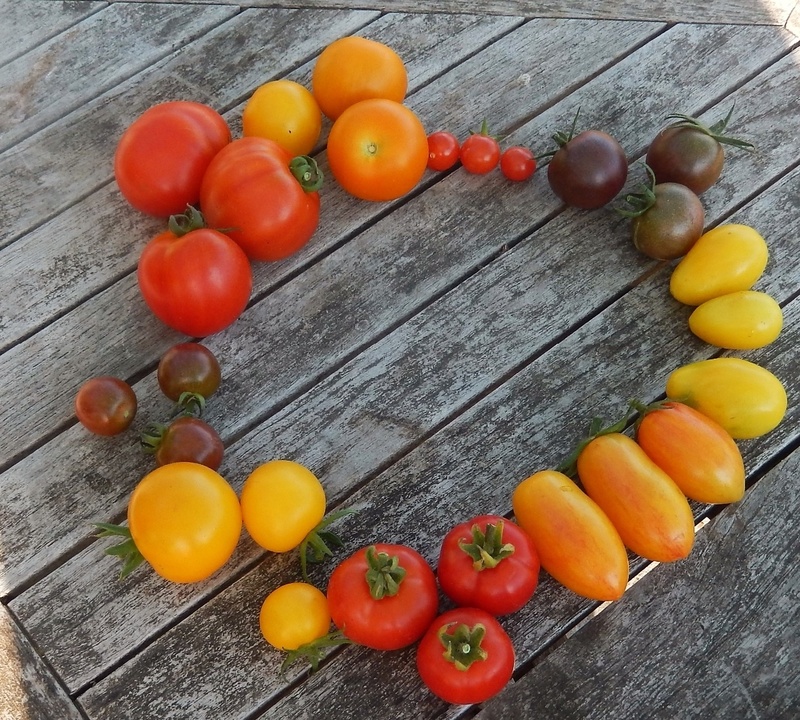 The tomatoes are ripening quickly still, and sometimes there are several kilos sitting in the fridge at a time: this week we have picked at least 6kg. The yellow and orange ones don't lend themselves to pasta sauce or passata in the same way as the big red ones, so I have had to really think hard about the best use of these. A friend was making tomato and basil jelly... hmm. And so I made a batch of Yellow Tomato and Basil Preserve, which turned out to be rather good. I can see it being useful for glazing meat for barbecuing, as well as accompanying cold meat or cheese. Most of the small jar has already been eaten, which is a promising sign. I shall post the recipe in a couple of days' time, with a photo of neatly labelled bottles, not ones straight off the drainingboard!! The Crimson Crush fruits are huge, which is why they are taking so long to ripen, but should be well worth the wait if they taste as good as last year's did. 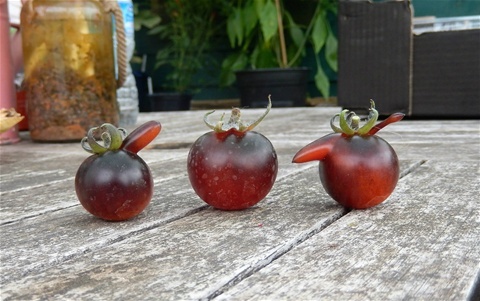 Here are some tomatoes that took their name of Dancing with Smurfs just a little too seriously!! 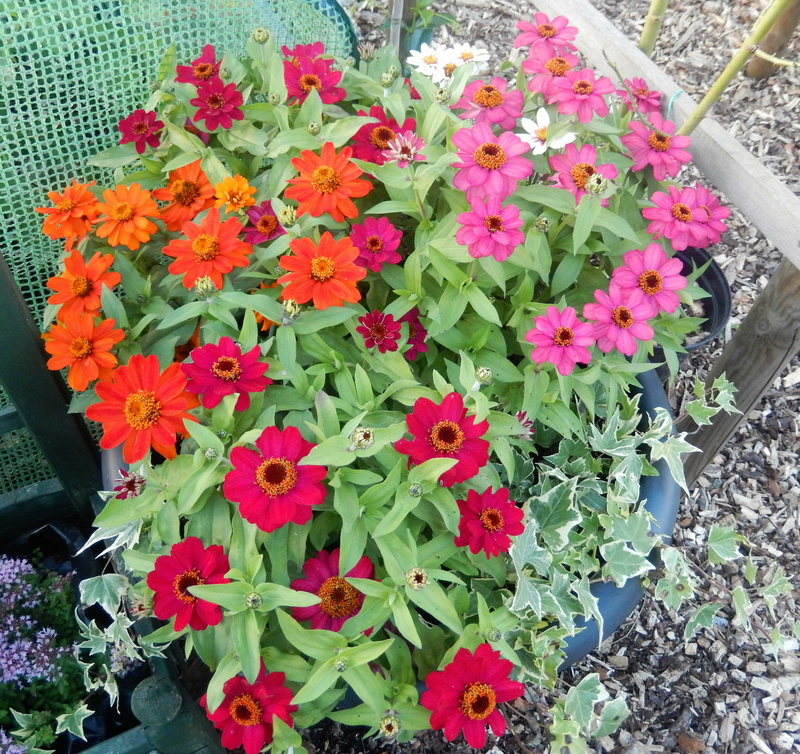 To be honest, they are a novelty rather than a variety I would necessarily grow again though. 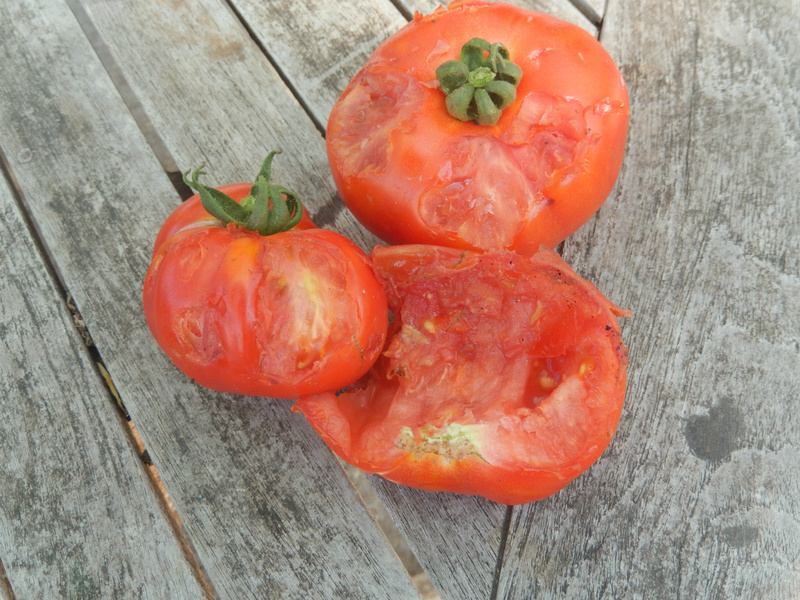 Navy blue with red bottoms might look cute, but they are not the best tasting tomato ever. Autumn Raspberry crops are improving, but will not be huge this year. Nonetheless, when you look at the price of a small punnet of raspberries, even the kilo or two picked so far are clearly good value! 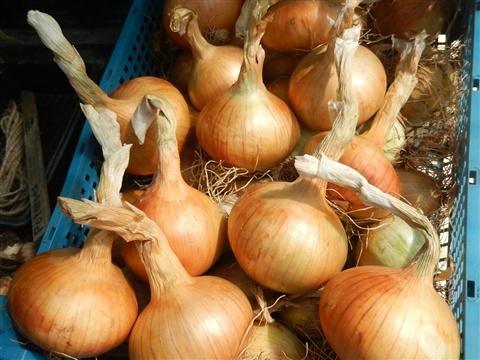 We eat them with plain yoghourt, rather than cook them, as they are so fragrant. 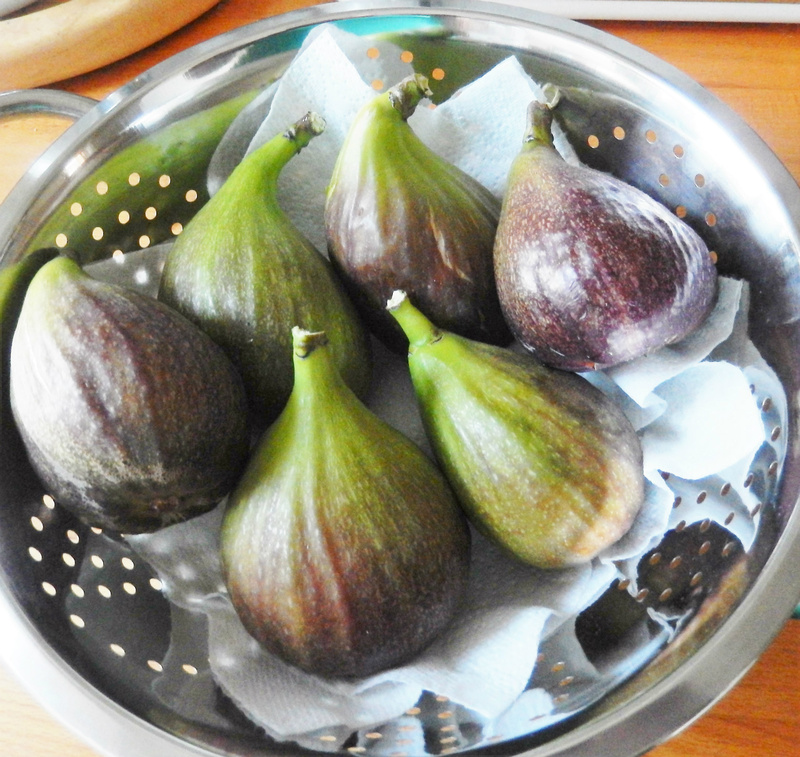 The last of the figs for this year, unless we have a really long, mild Autumn to ripen the second crop of course. 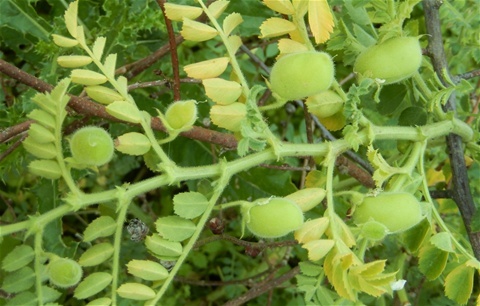 If not, these small fruits will be take off so that the tree can focus its energies on next Summer's crop, which will be developing in the leaf axils even before the leaves fall for Winter. Although harvesting and watering has taken up most of the time this week, other things have also needed attention, including weeding! 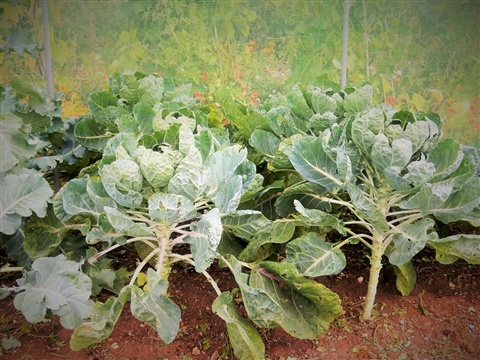 There seemed to be something odd about the Romanesco cauliflower plants, as despite plenty of water, most of them wilted almost every day, and yet the kale plants next to them in the same bed were fine. I decided to dig one up to see what was going on under the ground and the roots were strangely gnarled and twisted. Maybe this is Club Root? Never had this before so I shall be very disappointed if this has been imported via bought in plants. 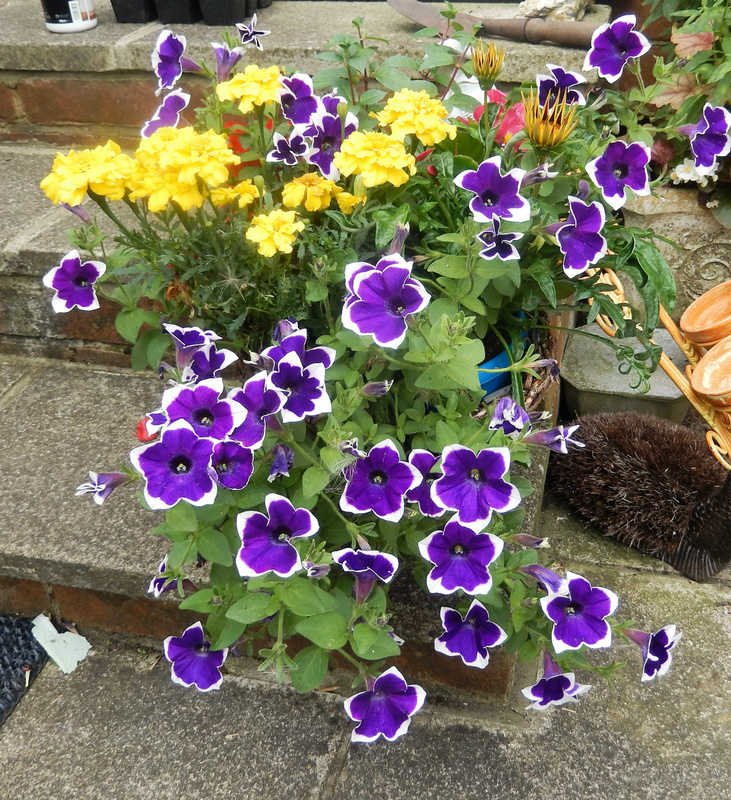 In case it is the case, the roots are now destroyed and the remaining three plants will be carefully monitored. 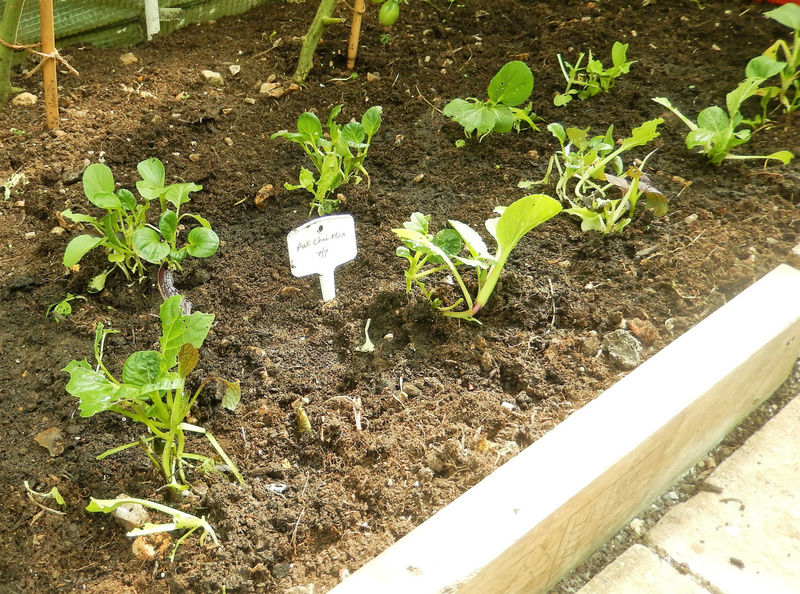 The space this created has already been filled with more small lettuce plants. 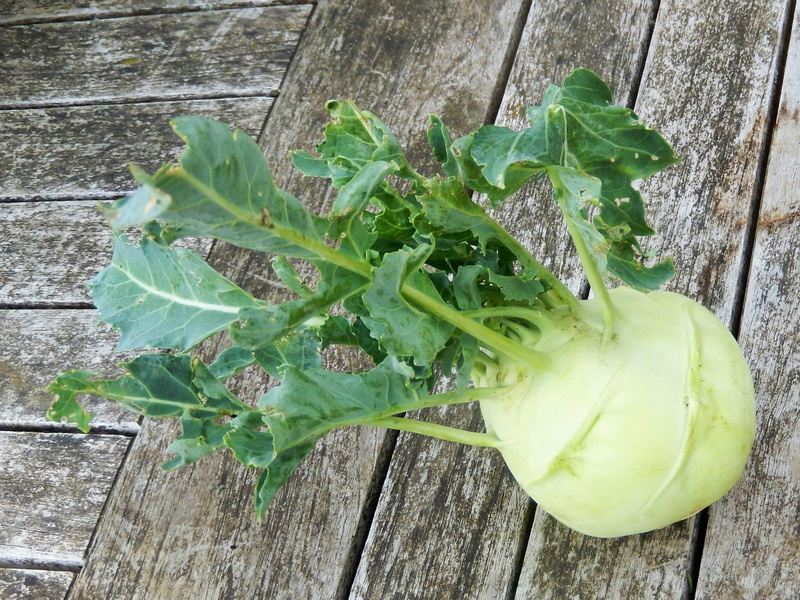 I also sowed some Mooli seeds, which I hope will crop by the end of the Autumn. This is a new crop for us, but something we enjoy eating, so looking forward to juicy roots, all being well. 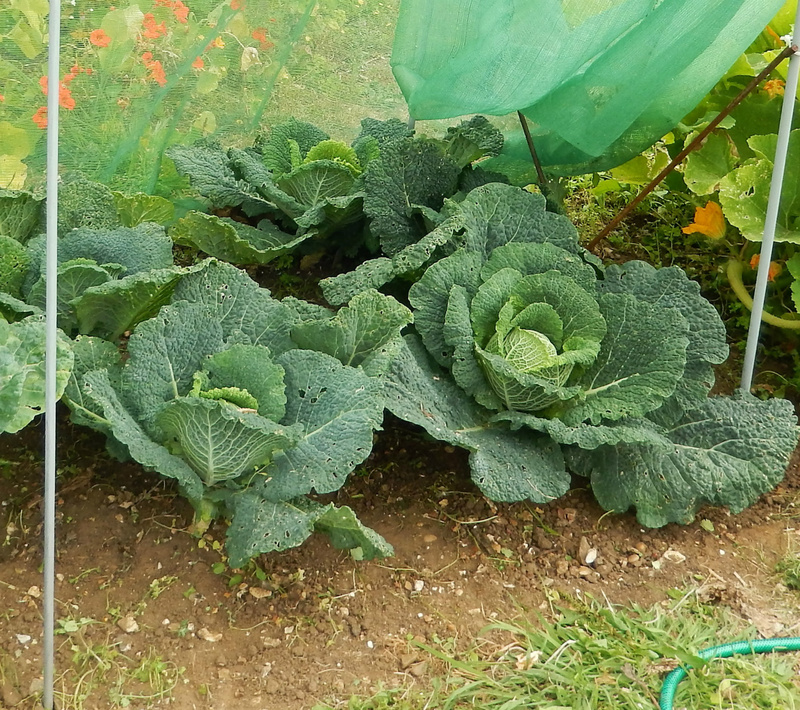 The pak choi in the mini tunnel is enjoying the shaded warmth, and will soon be large enough to eat... watch this space! 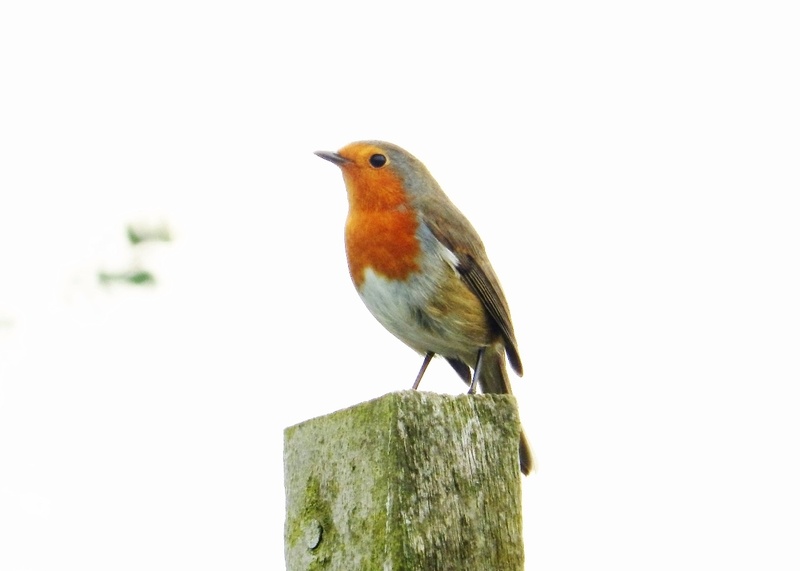 Usually I end the weekly entry with photographs of flowers, but I could not resist this one of a robin, resplendent in his red vest! Tomatoes are in full flood now! 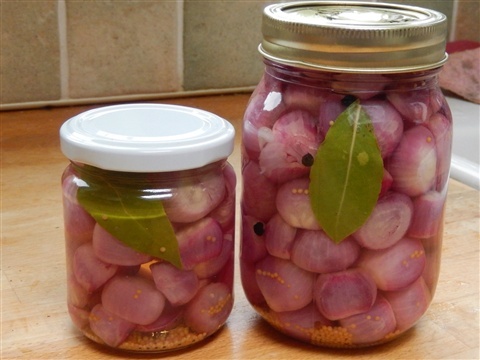 15th August - Preserving every day to share for Harvest Monday! With so many crops in full production now it is a long job keeping up with putting them all to good use so that nothing is wasted. 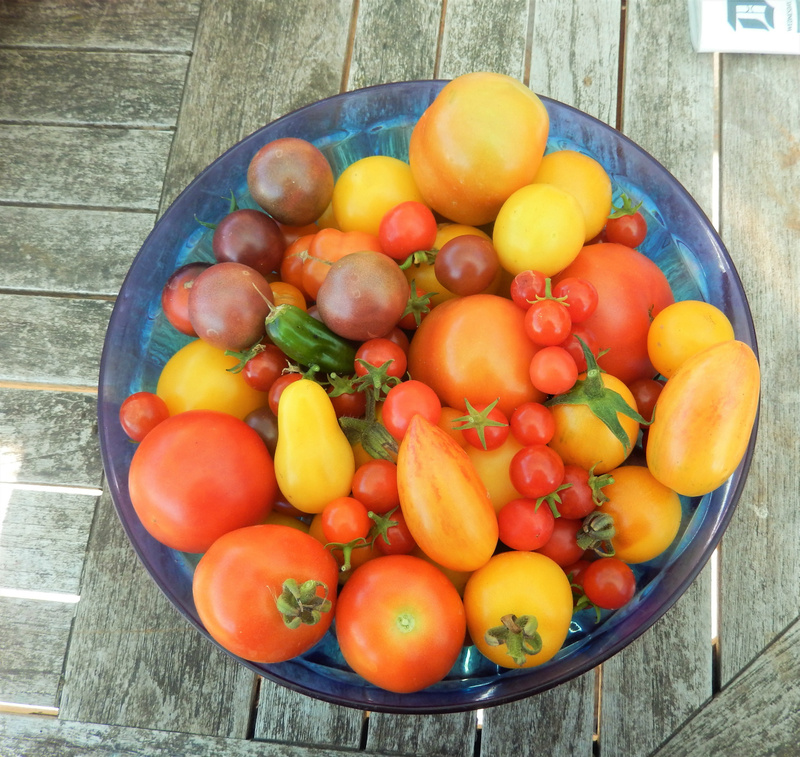 This week I have picked just under 4.5kg of tomatoes for example (Two of which were half an hour ago) and there are only so many we can eat in salad. 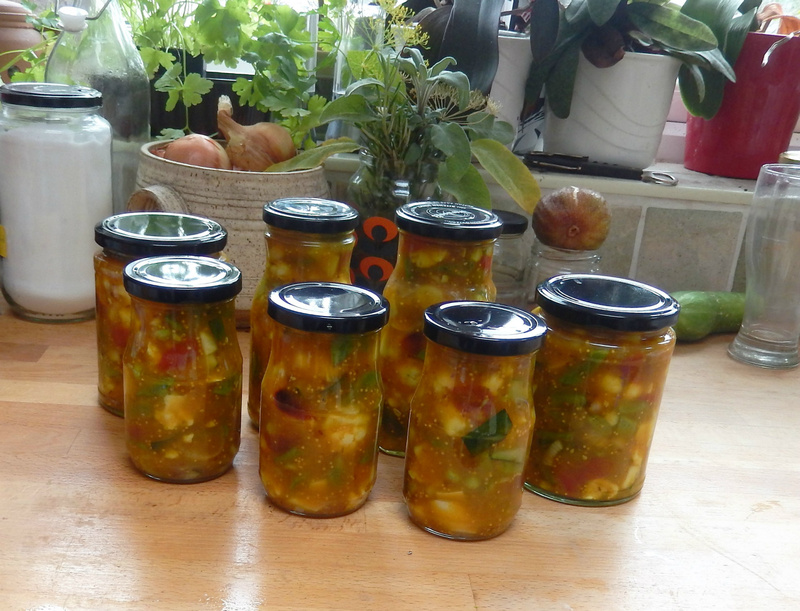 So.... the first batch of mixed Tomato Chutney is now safely on the shelves in the garage. These 10s & 1000s get added whole for the last five minutes of cooking, and so stay in one piece in the jar, which gives rather nice bursts of flavour. 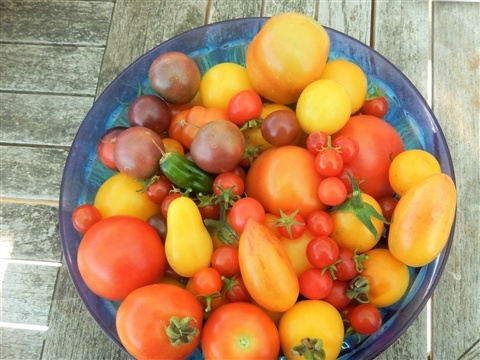 The tomatoes in the photo above are (clockwise from 6 o'clock), Sandpoint, Yellow Sunrise, Black Opal, Moneymaker, Sungella, Matt's Wild Cherry, Chocolate Cherry, Yellow Pear and Blush. 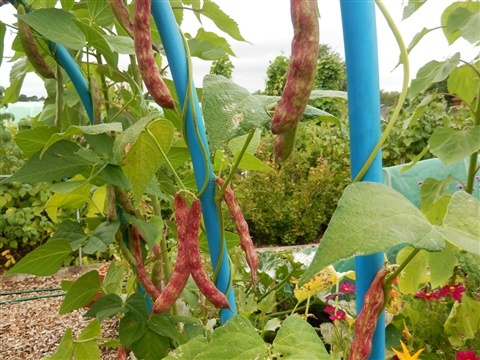 There are still several of the larger varieties which have not yet started to ripen yet, and with such dry weather I am hoping we escape blight before we have bowlsful of juiciness. This has been a favourite for years now, and I can almost make it blindfold. Just for a change there was not even one drip on the cooker, the worktop, or even the edge of a jar ...amazing!, as usually clearing up does take some time. 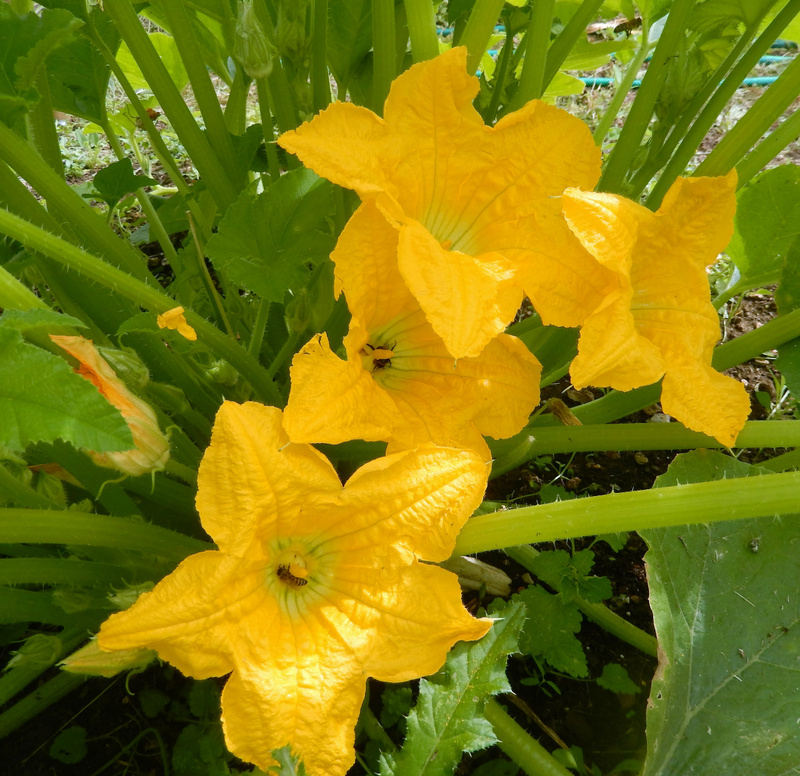 Courgettes continue to figure this week. I have given masses away to apparently grateful recipients, but they are definitely coming to the end of their cropping now. Their leaves are mildewing despite extra water and feed, so I shall be letting them give in with good grace to join the compost very soon. This week however I made something quite different, which was so delicious we ate it all before I remembered to take a picture. Now there's a good reason to make more if ever there was! It was based on a recipe from a grower in India, Akila Krithivasan, for Pumpkin Halwa, and I substitued courgette for the pumpkin. Wow! Very sweet but totally yummy. When I make some more I shall add it to the Recipes. Thank you Akila. 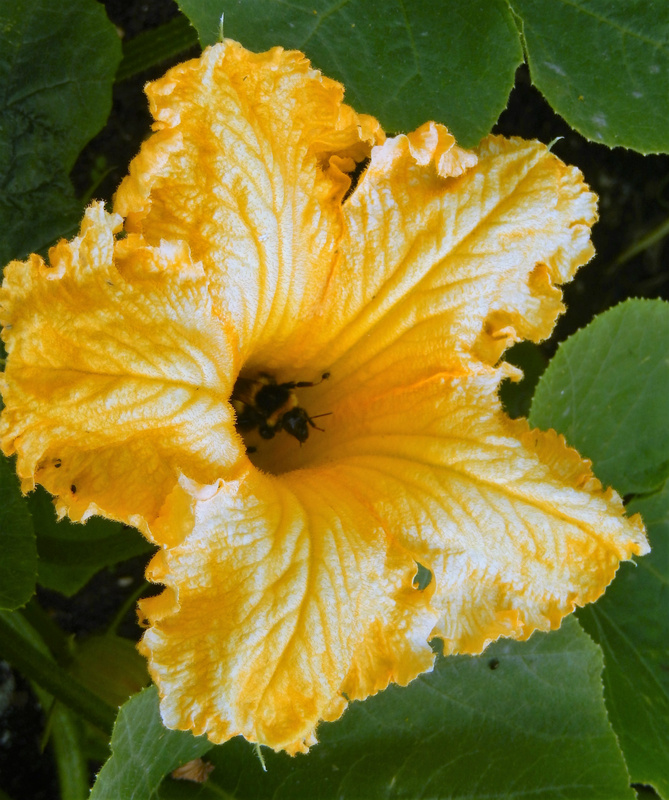 In India it is made to eat at celebrations, and I am sure there will be plenty of occasions for it to be eaten each Summer during courgette season from now on. 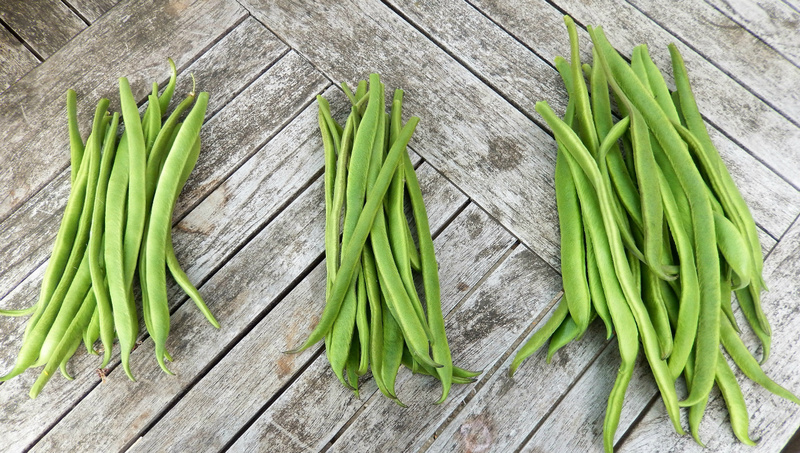 If you remember, I wanted to compare the harvests of the three different varieties of runner bean we are growing this year, as well as compare the quality of the pods through the season. 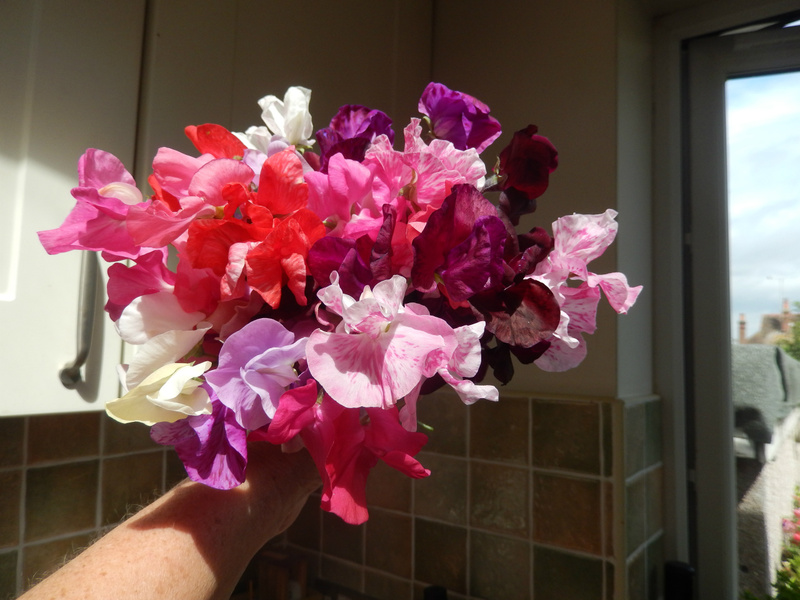 Here are Thursday's pickings: from left to right Moonlight, which is a white flowered variety, Firestorm and Benchmaster, both of which have red flowers. It is clear that the pods of Benchmaster are longer and thicker, but the other two have a much finer flavour, whilst Benchmaster more readily becomes coarse as the pods get larger. 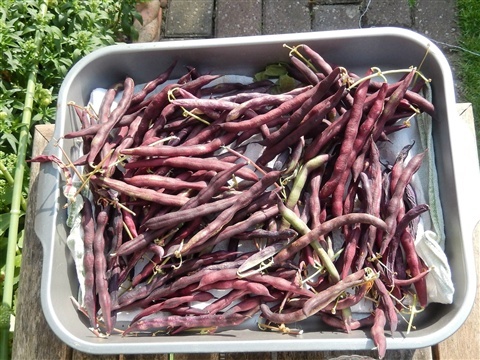 It was very touching when I gave one of my neighbours some beans this week and she said "Oh! 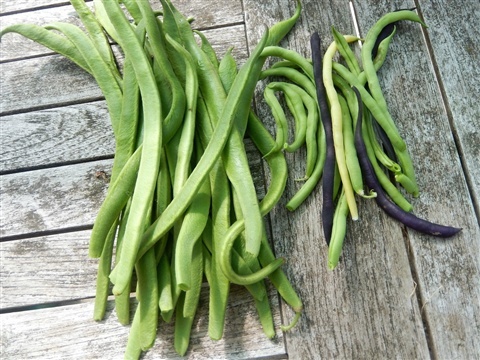 Proper runner beans - I haven't seen any for years!" This week overall I have gathered 3.4kg of runner beans, some of which we have eaten, some of which are frozen and some are pickled along with the carrot harvest this week. 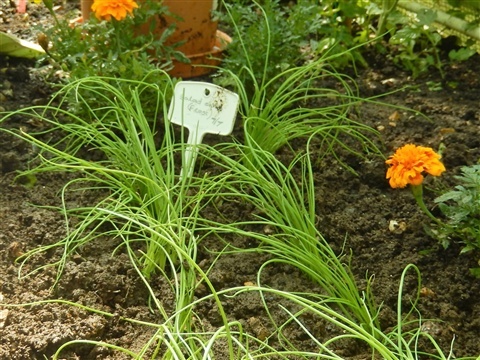 Herbs are so easy to grow and so expensive to buy! 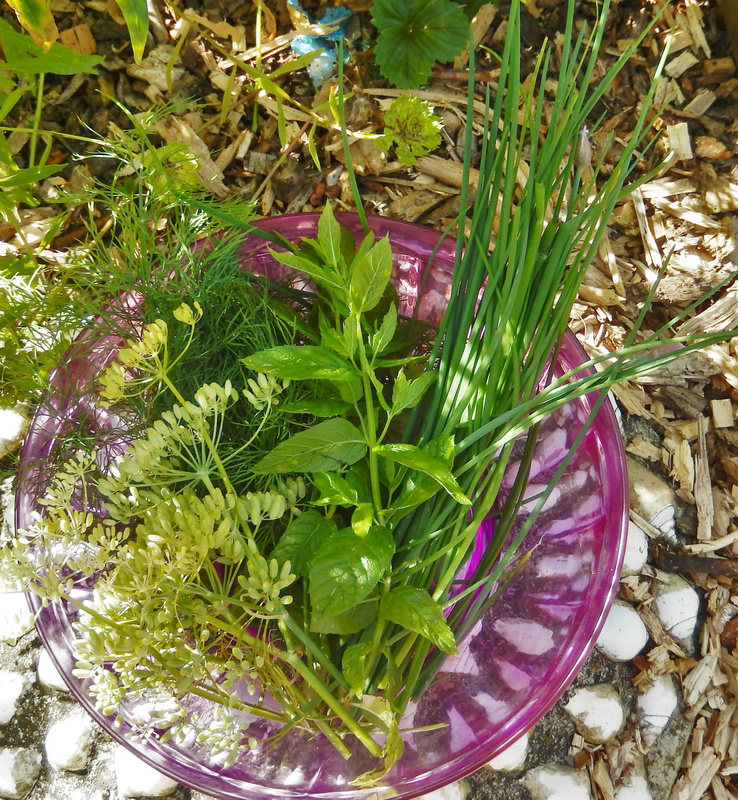 We do grow a wide range, but this week we have harvested Spearmint, to be added to Iced Elderflower cordial, Chives, which went in the frittata, Dill flavoured jars of pickled gherkins, and then there are some fennel seeds. 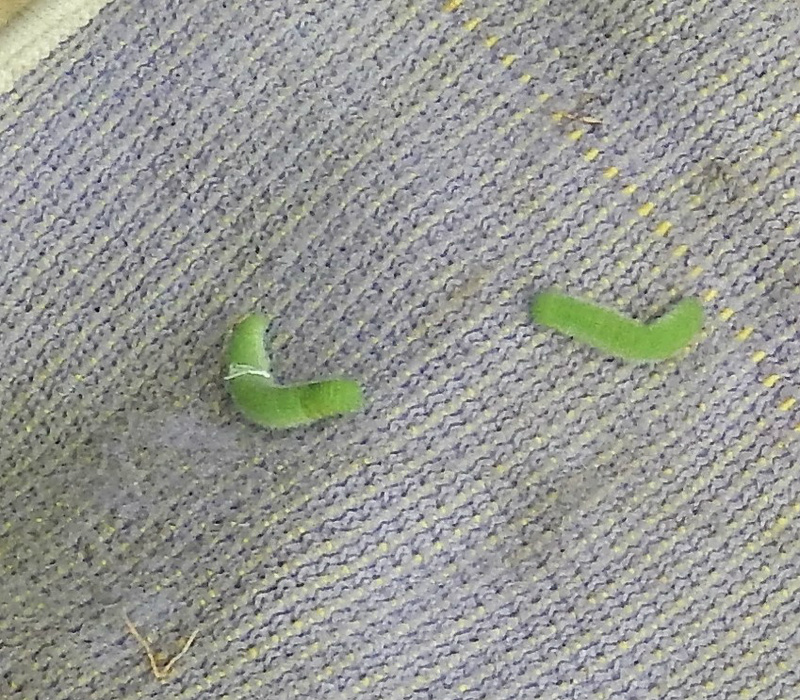 These are still green, but so delicious to munch on. A couple of spoonsful were added to the tomato chutney, and the rest hung to dry before they are stored to last us the year. 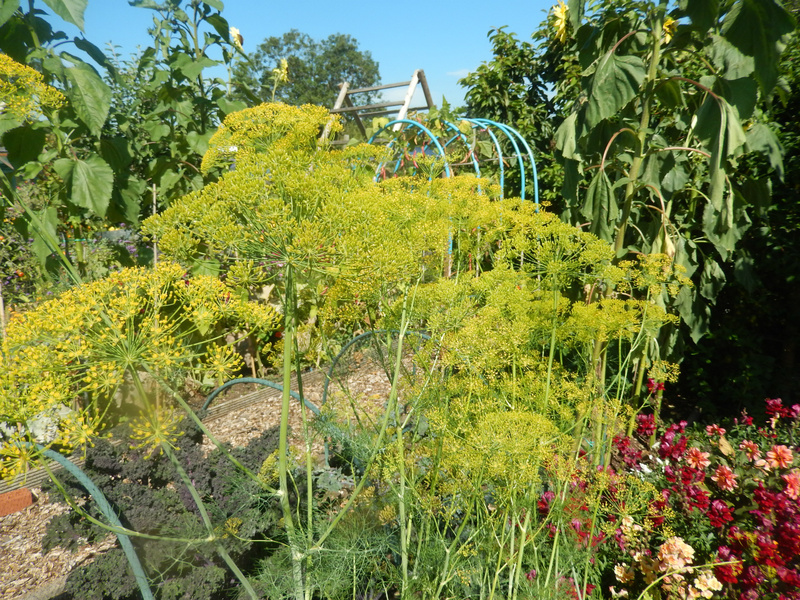 Fennel self seeds easily and almost grows like a weed, but as bees love the flowers and we love the seeds it really does not matter. 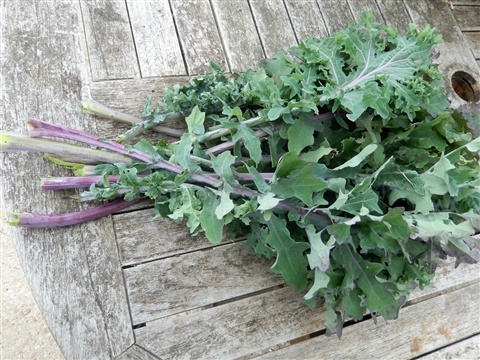 The Purple Sprouting Broccoli plants are in the same cage -- they are huge for this time of year! After having a Summer of "green paths" on #145, and considered the amount of work it takes to stop weeds encroaching on the beds, and also keep them cut below knee high, it is all change!! Abi has decided it will be less work in the long run to have weed suppressant membrane paths with a layer of woodchip on them, and wooden edges to the beds. 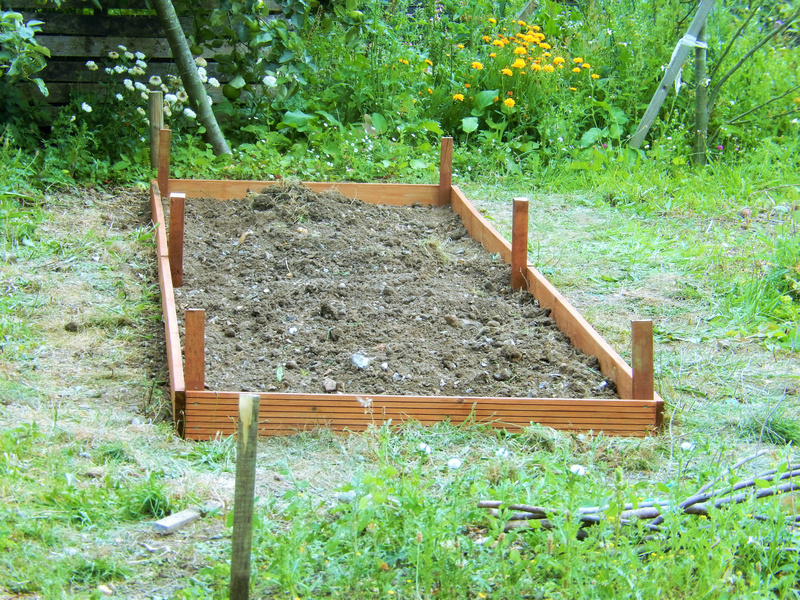 With some help from our son and his roof rack, the wood was taken down to the plots and the first bed is now edged. It does look good! Hard work though with the soil currently resembling concrete. The soil is really quite impoverished and so as each bed is edged and weeded, compost or leaf mould will be dug in before anything else is planted. 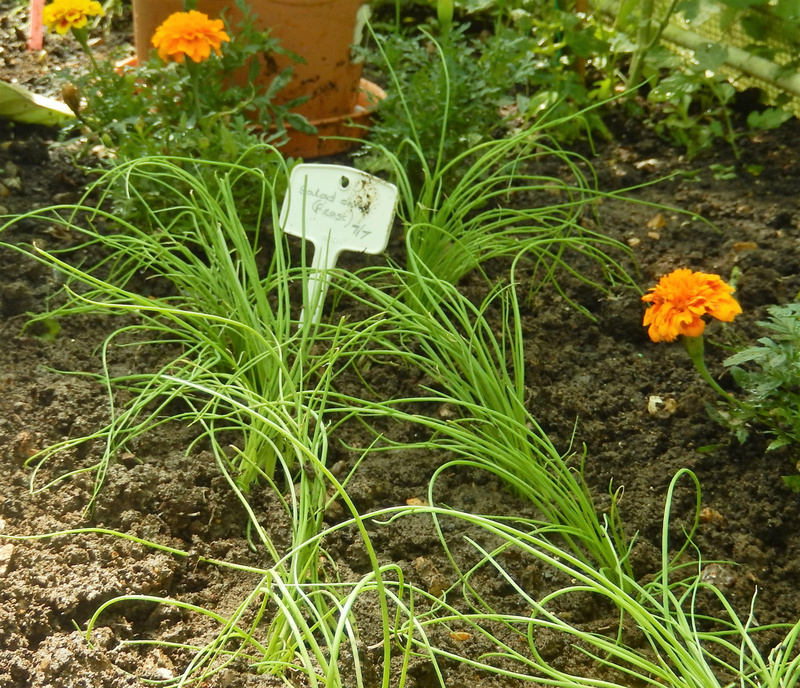 Next in this bed will be the rest of the leek plants, which have continued to grow on in a deep tray until space for them becomes available. 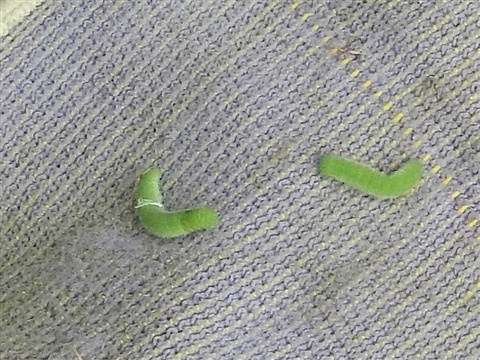 Then the question arises as to whether to cover them with fine mesh for a month or two, until the adult Leek Moths have finished laying eggs. I think we probably will do, so shall be constructing something suitable soon... watch this space! This is a view across #146 on Friday, and you can see the enormous parsnip leaves to the right. 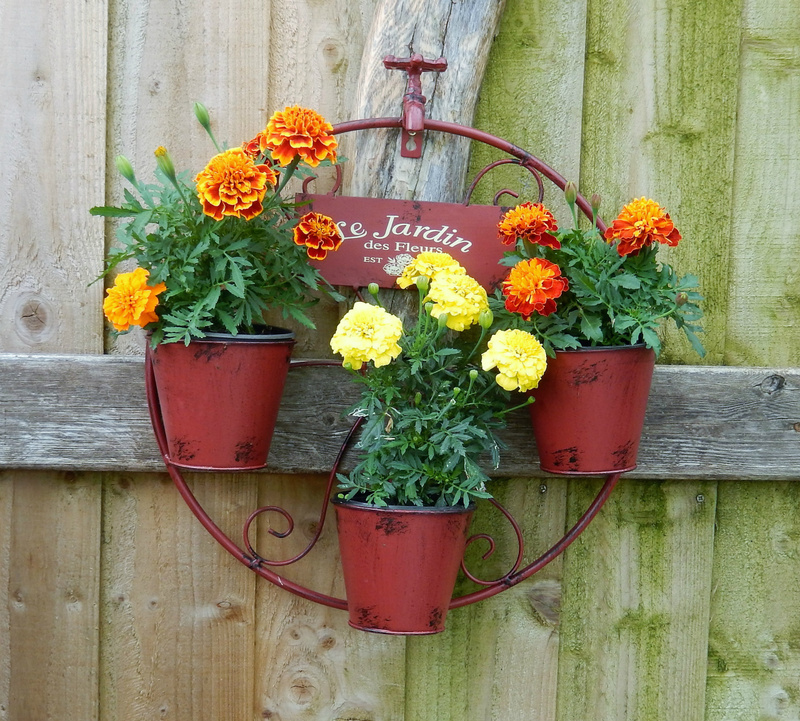 For the first time ever I am watering these, as with no rain to speak of for over six weeks now I was not sure they would grow very well. Once a week they get a good soak, and the leaves are still looking strong and healthy, which is a good sign! Hopefull the roots will be swelling steadily and not split along the edges. You can never tell until you dig them up but I have tried my best to water them consistently. 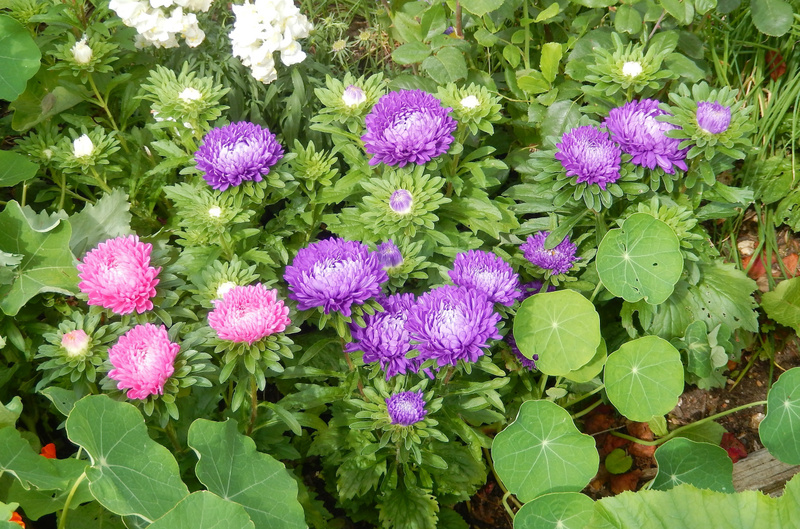 And here to end this week, are some of the beautiful plants we have right now ... hope you enjoy sharing the pictures of them! 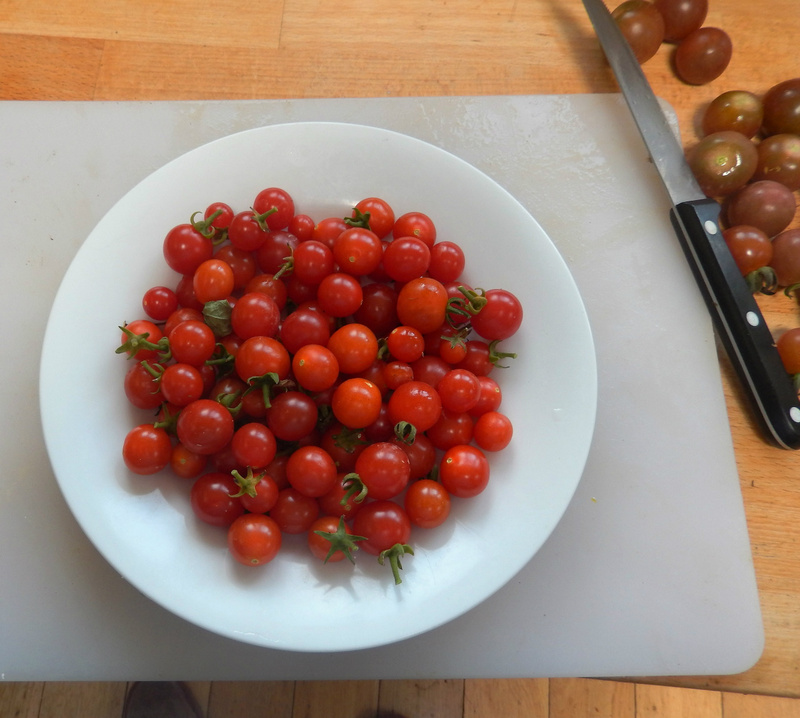 Some days our harvest fills the worktop! 8th August -- Harvest Monday!! 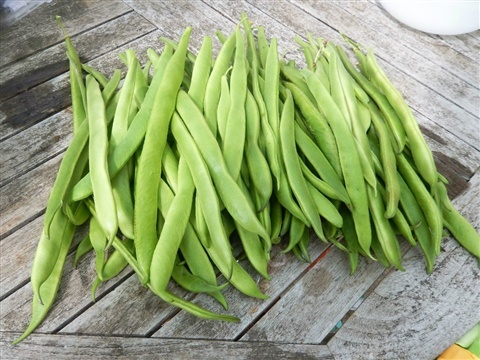 This week has been a real turning point on the plot, with the worktop in the kitchen loaded with produce, the freezer bursting with beans and a carpet of potatoes on the kitchen floor! 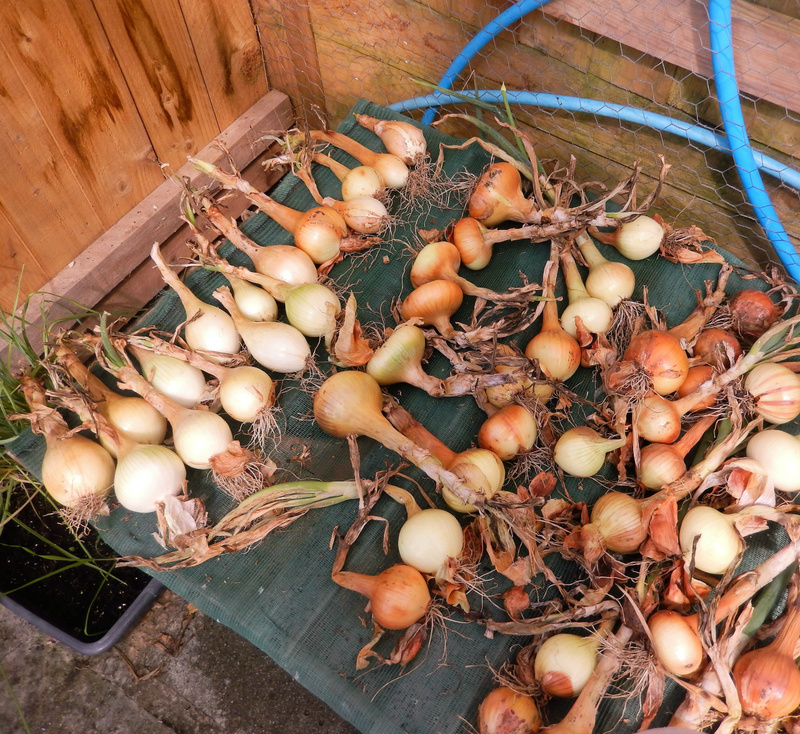 The shallots are still not quite dry but we needed the space on the rack for the remaining onions, so they came home with us to sit in the garden. 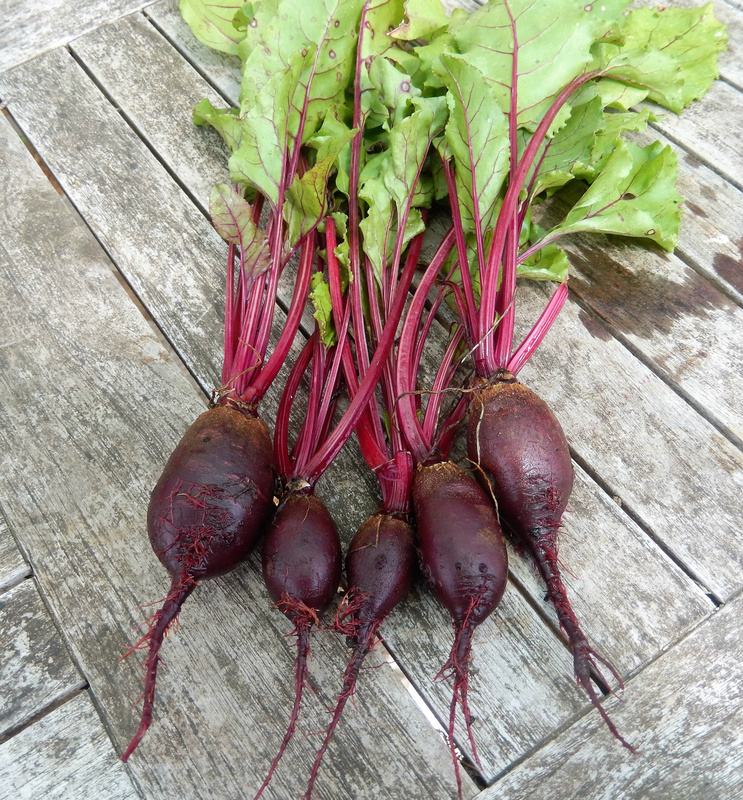 Jermor is a new variety for us, and, having tried some in fritters, I can vouch for their flavour! 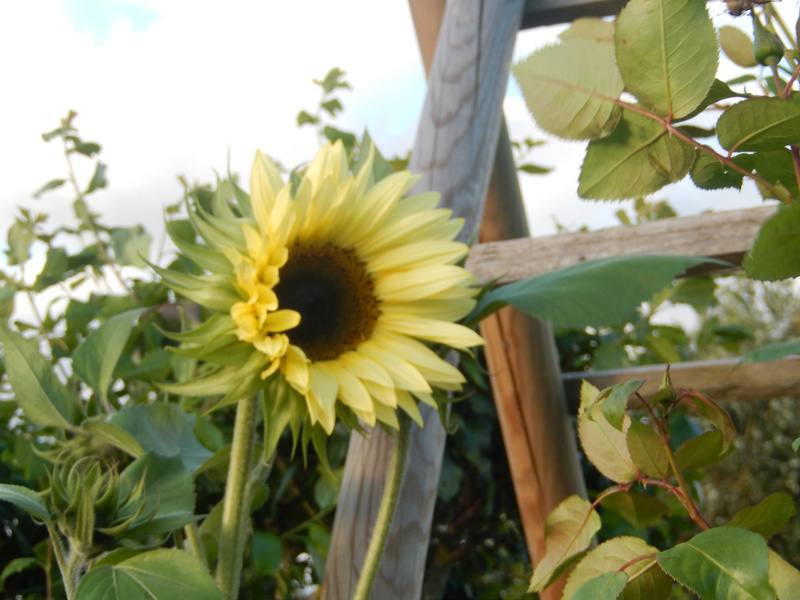 There are enough small ones to plant out for next year's crop, in a few weeks' time.... saves buying more sets too!! 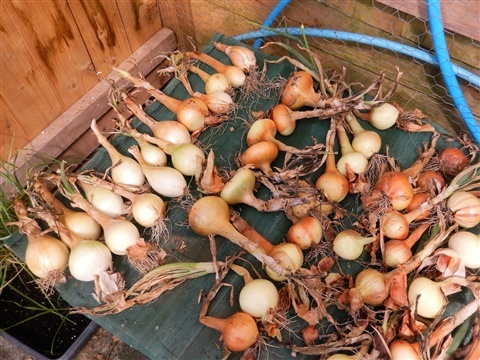 These are the onions ... the white ones are Bedfordshire Champion, grown from seed, and the brown ones are Stuttgarter Giant, grown from sets. As you can see, they are all rather smaller than you would expect and will certainly not be making an appearance on the show bench! 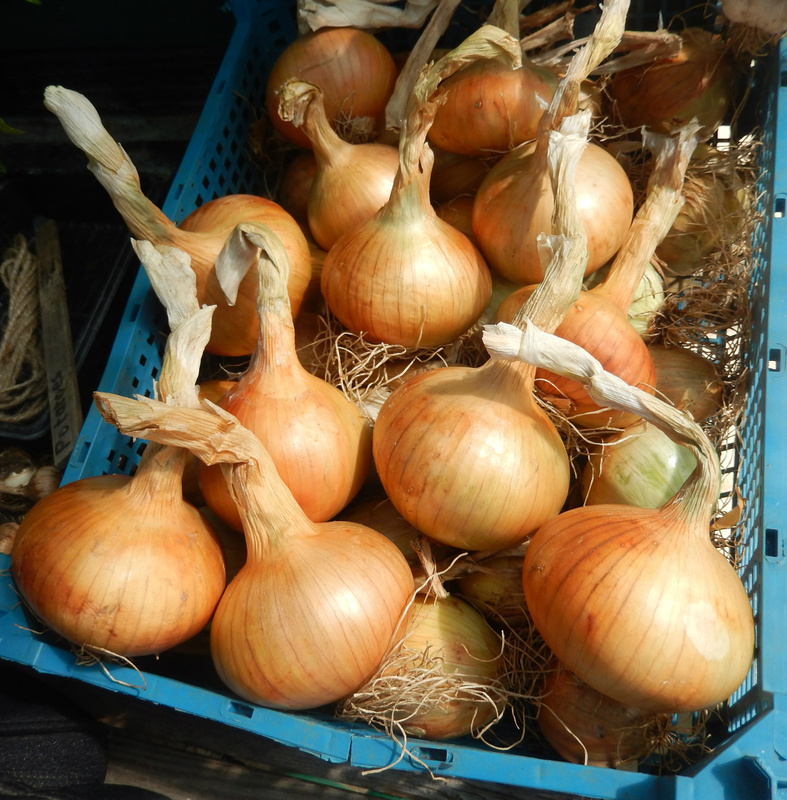 Like all our other onions, they have suffered from a whole raft of pests and diseases this season, and to be honest I am relieved to even have any sort of crop at all. Once they are fully dry they will be going into their trays in the garage, to hopefully last us a while. MInd you, a fair few will be used up in preserves! Hercules are a nice size for cooking with. 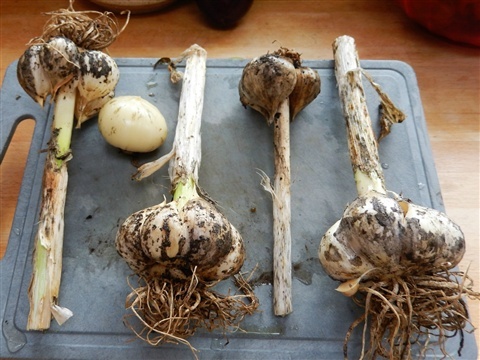 My comparison between sets planted directly into the soil at the end of March, with those planted into modules at the end of February ended with the latter having significantly larger bulbs. 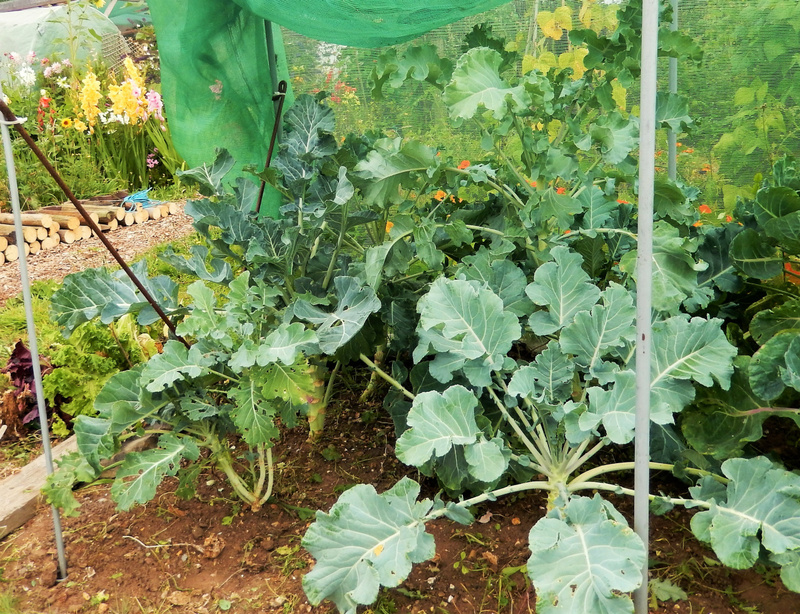 It was a bit of a faff juggling round in the greenhouse at a time when space was at a premium, so next year they will be out in the cold frame! 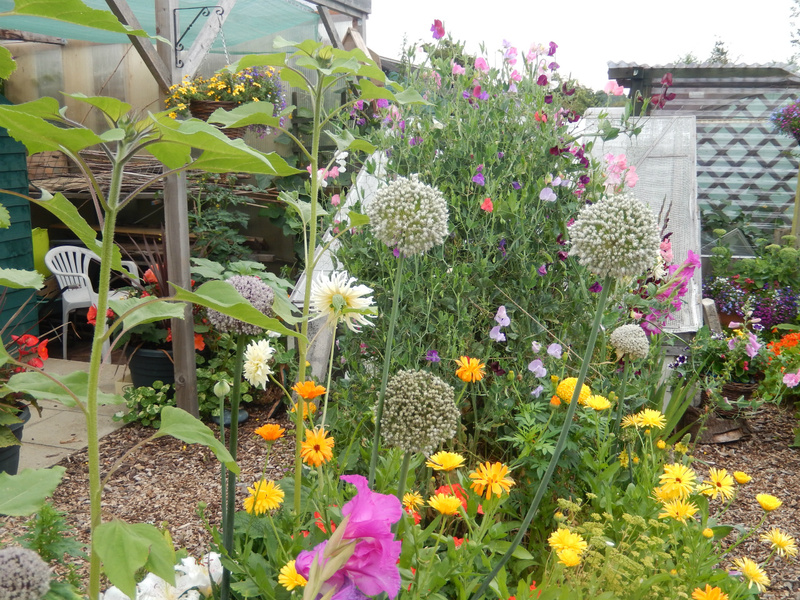 I only planted six like this, and that was enough to fiddle about with really, so the idea of planting our whole crop in this way would be somewhat daunting! 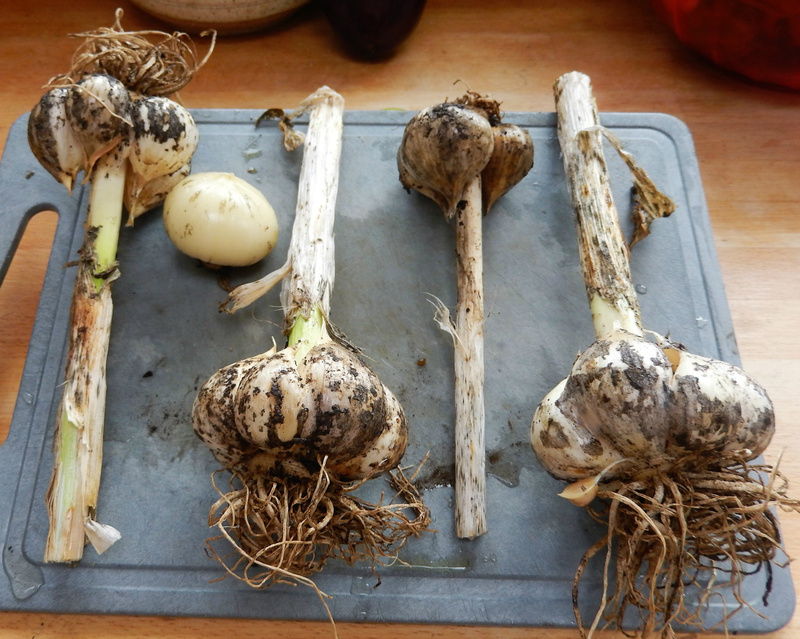 I planted four cloves of Elephant Garlic last Autumn, plus a small one left from the previous year, and here is what was dug this week. I think I left them in the ground slightly too long as the cloves have started to separate at the top, but their flowers were lovely and still being enjoyed by the bees in a vase on our table on #146. I think the single unsplit round one must be from the tiny clove. Not sure why this has happened but it will be added to the roast potatoes very soon. 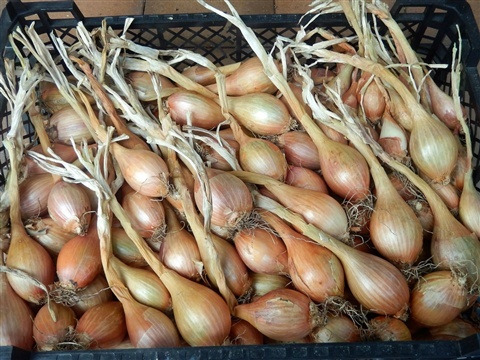 I shall keep some of the fattest cloves to replant this Autumn, as they are so expensive to buy, and see if I can build up to having a larger crop in future. 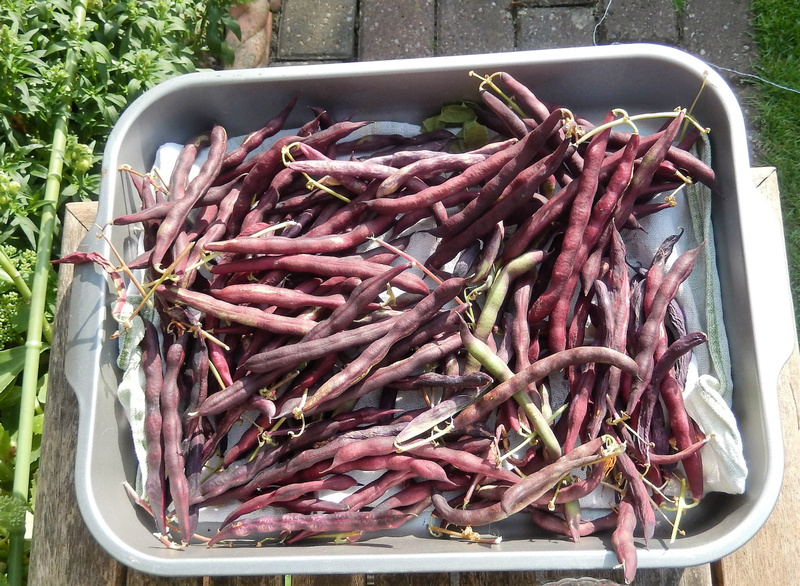 And let's not forget the beans. Every day there is a large handful of runners to bring home, which, if we are not eating them that day, are blanched and frozen. 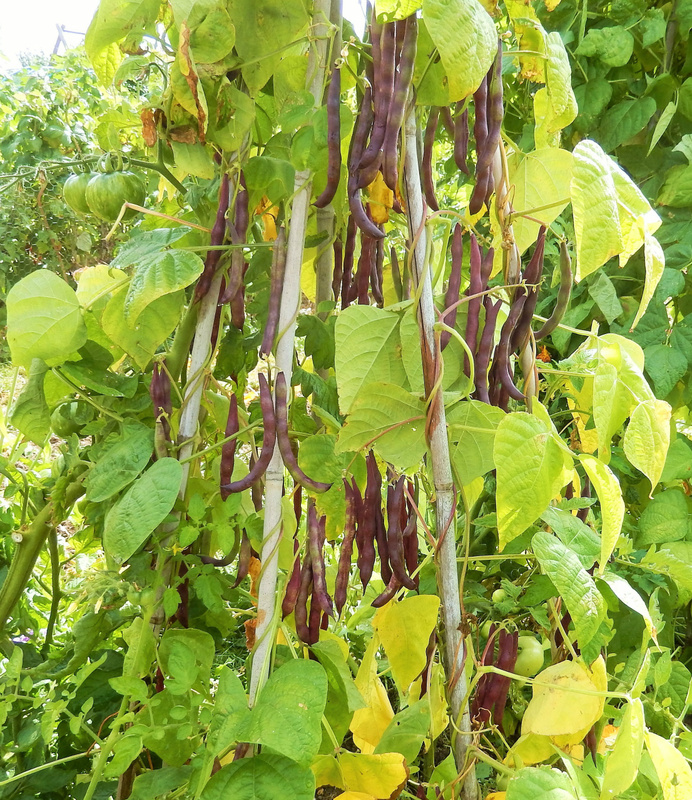 The climbing French beans are not flowering as much now so I gave them a feed of tomato fertiliser to help them to keep going. 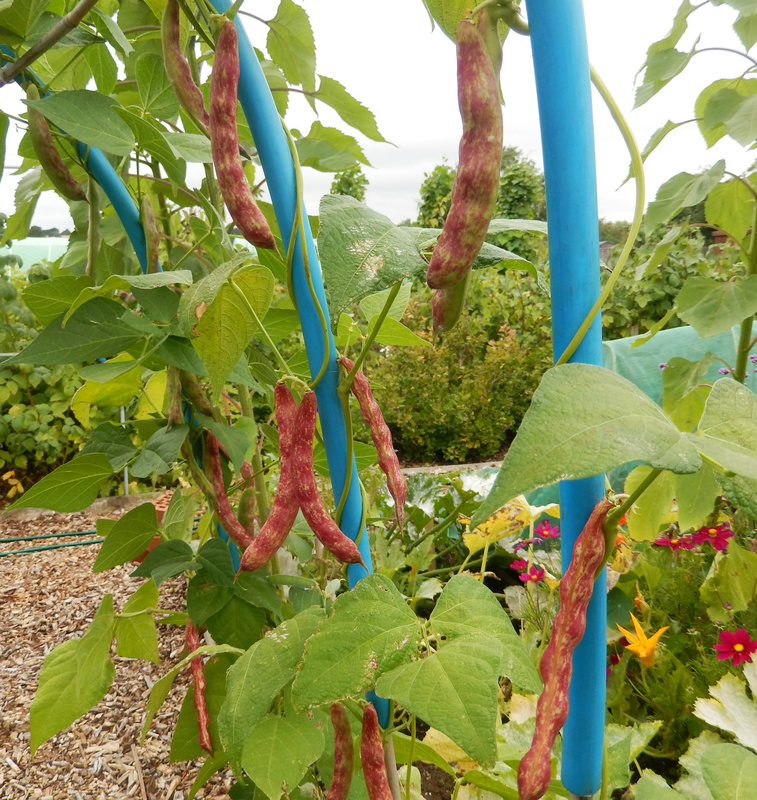 The little dwarf beans in the mini-tunnel are at last exhausted after their marathon, and so have been consigned to the compost heap with our grateful thanks! 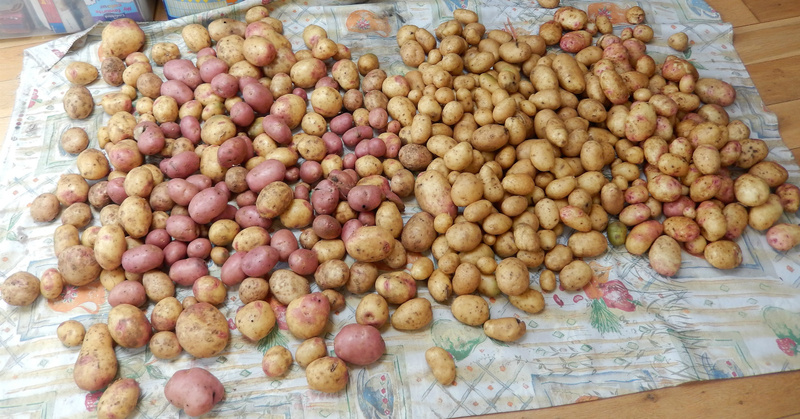 We dug up the second early potatoes (Bonnie & Wilja) this week, and most of the maincrops too (Amour & Maxine) Due to lack of water the plants were just about finished anyway, and leaving them there just invites rats to have a snack or two in passing. Best we have them stored safely at home. I just need to go through them and put aside any that are damaged to be used first... if you have ever smelt that vile smell of rotting potato, you will know it is worth the extra effort for sure! The soil on #145, which is the one we took on in March, is in dire need of organic matter, and very limy, which coupled with little water has led to the potato skins being very scabby. They are fine to eat as long as they are peeled but again... nothing for the show! 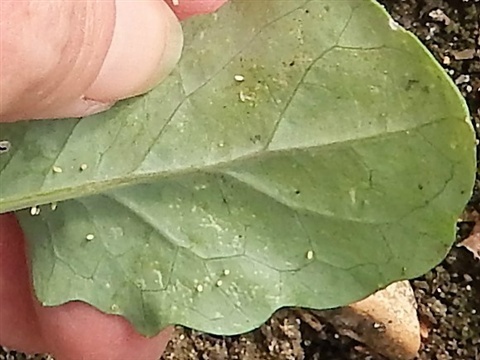 Never mind, we first and foremost grow what we want to eat, and these will certainly feed us for months. No prizes for guessing who will be ordering a trailer load of manure very soon! 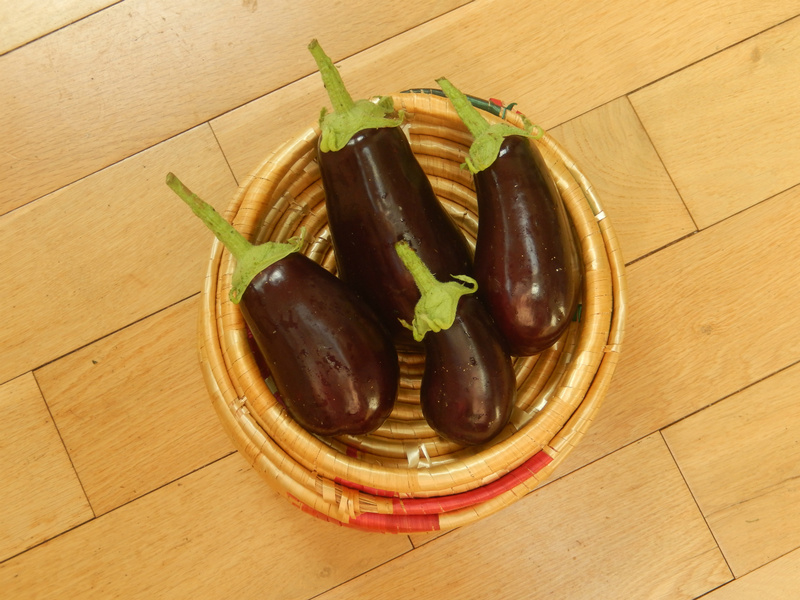 Aubergines from the greenhouse at home are nearly finished, thanks to the attentions of red spider mite. These here will be the main event in a chutney I made last year, which turned out to be my daughter-in-law's favourite. 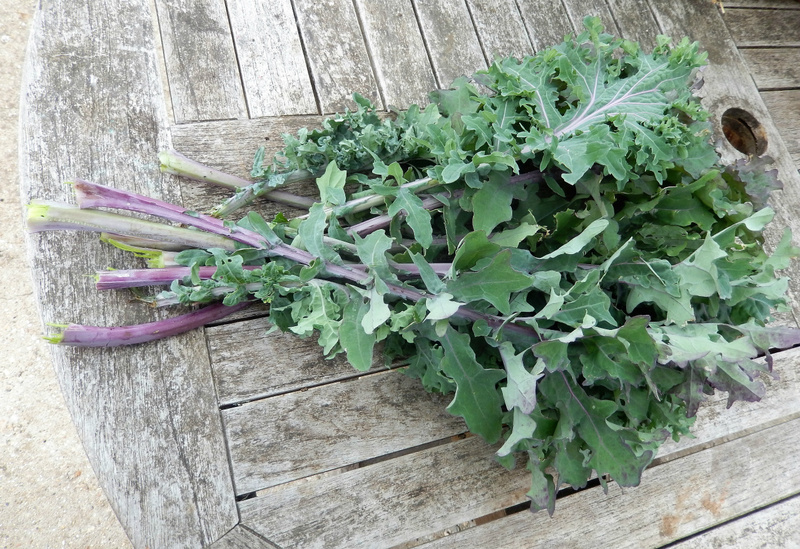 The plants in the mini-tunnel on #146 are still fruiting so I might even be able to make a second batch. 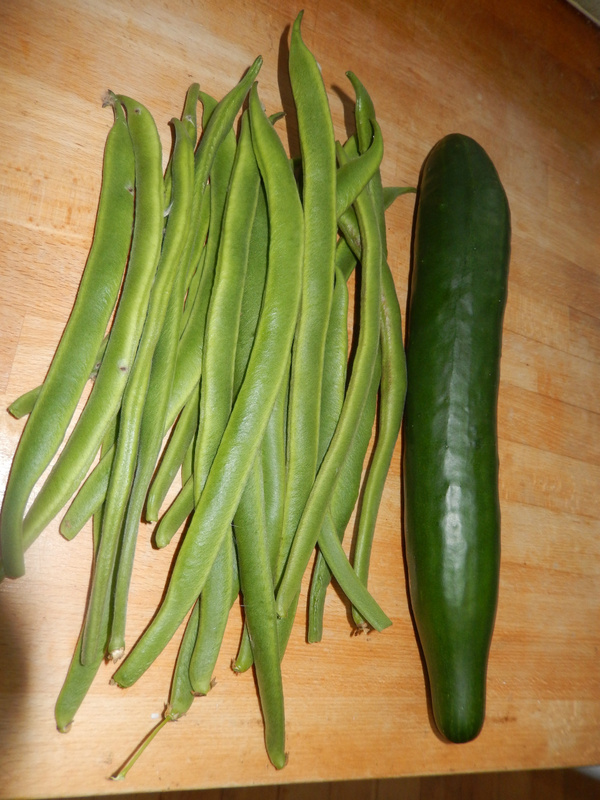 One of the above will be used for Brinjal pakoras tomorrow though!! 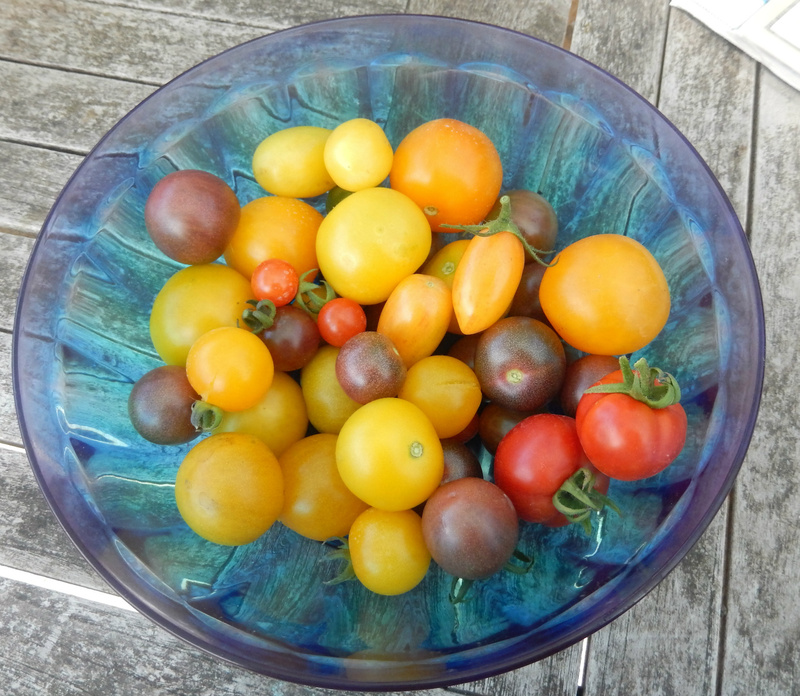 Here...at last... are some red tomatoes in the multi-coloured mix!!! The dry weather has so far (fingers crossed) protected the plants from the ravages of blight, and we are well supplied with juicy tomatoes. Looking forward to the big red ones still though! 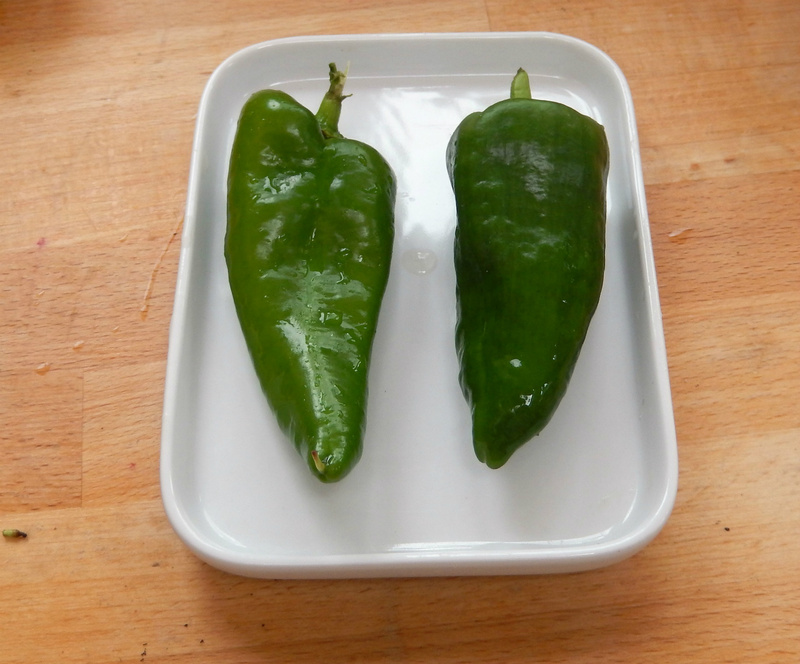 To the untrained eye, or those growers who year after year have delicious bounties of sweet peppers, these may look rather measly, but round here this counts as success, especially this year with the lack of sunshine for so long! Bullhorn peppers have fruit large enough to eat... hurray!!! 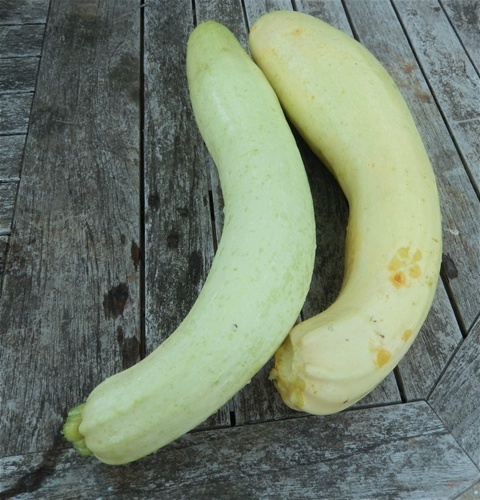 And then there are courgettes. I nearly said "of course" until I remembered last year we had so few it was embarrassing. 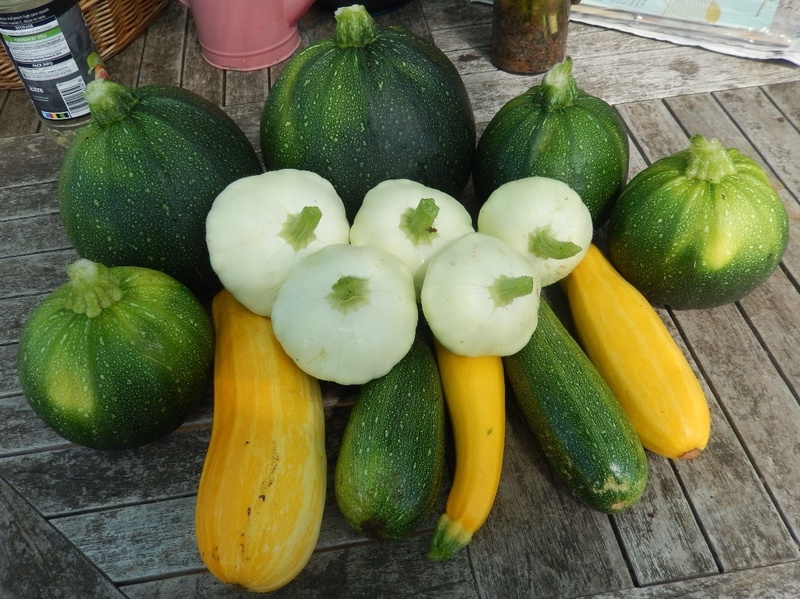 This year however, we have a plethora of courgettes of all shapes and colours ... and sizes! 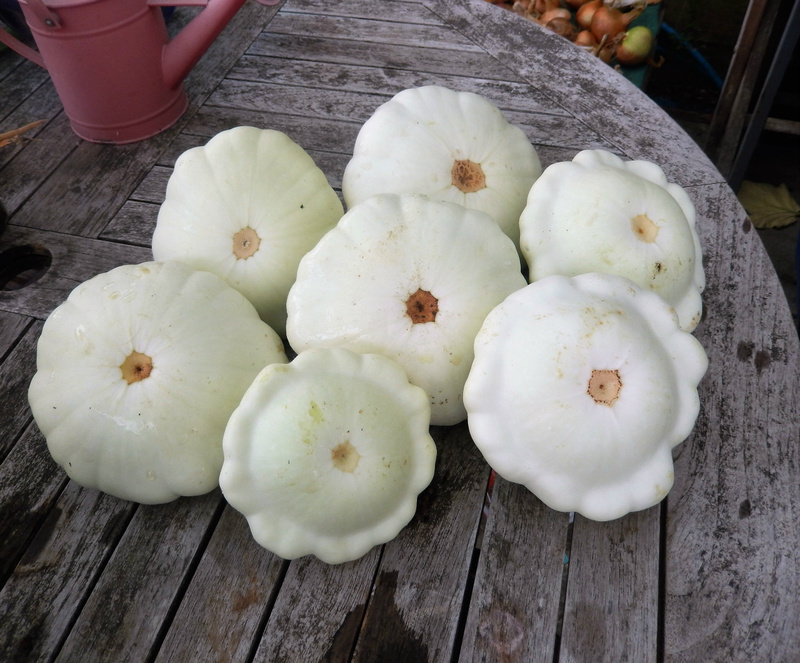 These Lungo Blanco sneaked off into the delphiniums to grow to the size of blimps when i wasn't looking, and at present I am not sure what to do with them. Perhaps a Halva recipe??? I'll let you know their fate next week! The ones below however, have so far contributed to some rather more-ish fritters (recipe to follow later this evening), grilled long strips with lemon and garlic, a side dish of fried patty pan slices with fennel seeds and one of the round ones is lined up as a stuffer. Three friends and our son's family have kindly rehomed the remainder, and I daresay when I go to the plot tomorrow some more will be smiling sweetly at me from the depths of their leafy bed. But I did miss them last year! 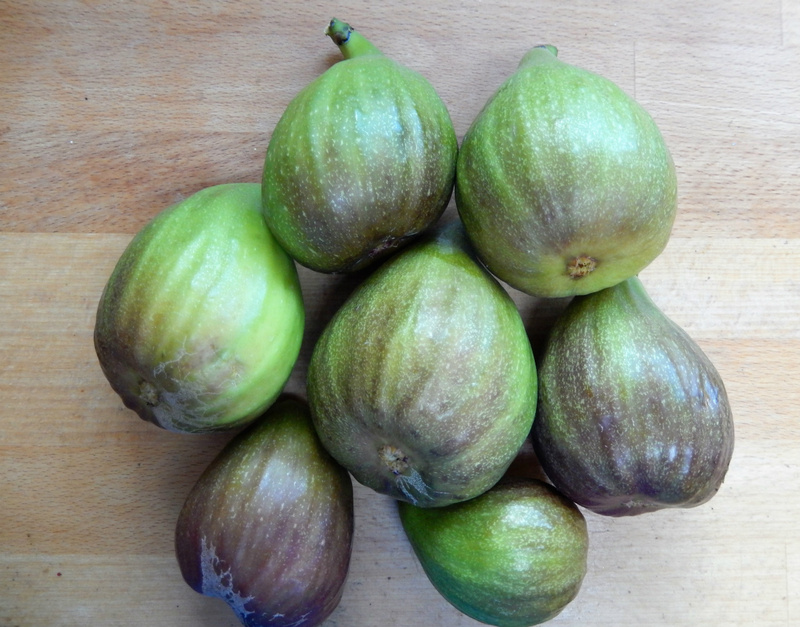 And here are some of the gorgeously juicy Brunswich figs from our tree in the garden. 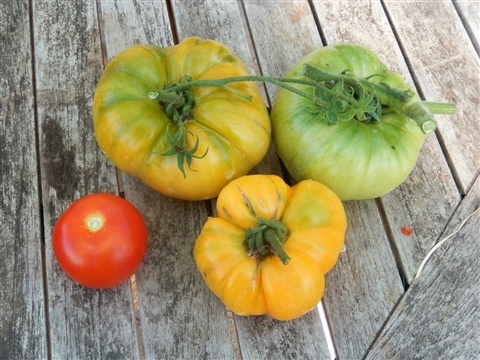 They need to be picked as they ripen or they split and wasps start to devour them. I'd rather we ate them ourselves. It always seems decadent somehow! We are not tired of eating them yet, but should that happen, a fig tart might materialise. We shall see!! And today I picked the first blackberries of the year!! 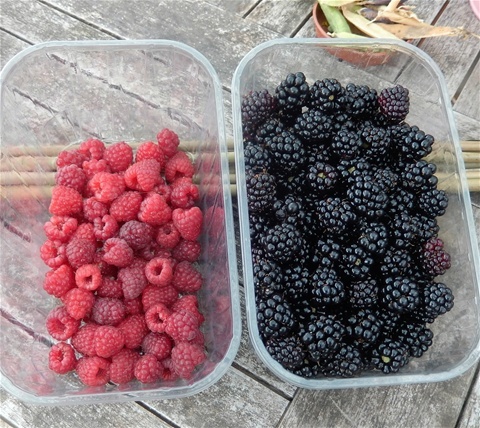 When the children were small we used to take them on holiday to the Isle of Wight, and often picked the first blackberries of the year on our daughter's birthday... which is today!!!!! It is much warmer there than on the mainland and so the wild berries ripened really early. These are not wild brambles of course, but are from one of the several plants we have forming a hedge the length of #146. This one came from my Dad's garden and has huge succulent berries. 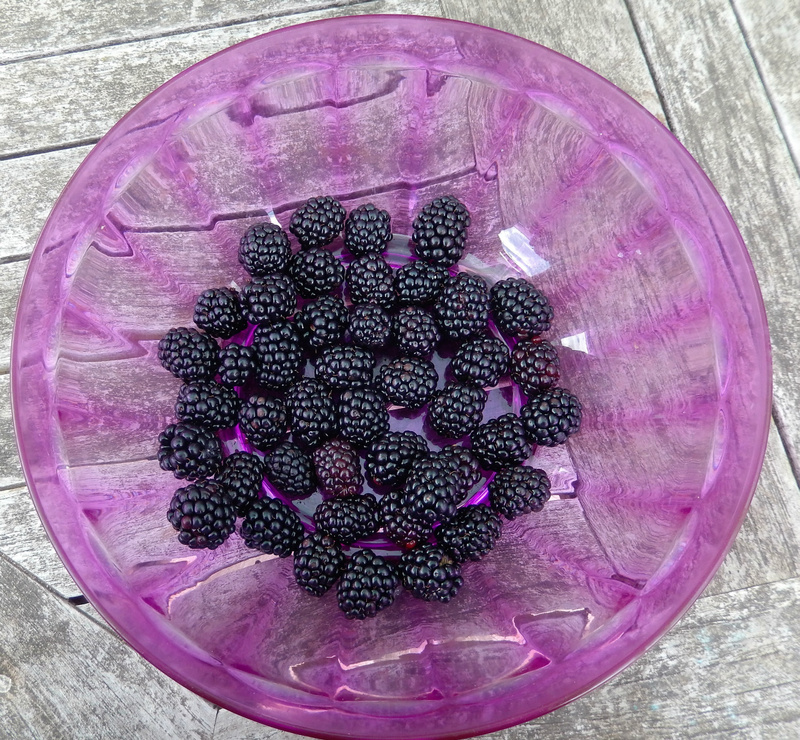 Pudding tonight will be stewed blackberries with honey ice cream. 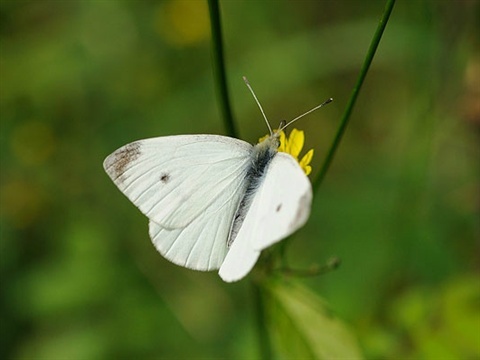 And this is the culprit, small enough to fold its wings and sneak through any holes in the netting, or even the netting itself if the gauge is more than 7mm. So moving on to what else we have been doing. Digging the potatoes up has left two empty beds on #145, which prompted much discussion about how we can more easily manage this plot. It has been hard work keeping them both going this season, especially with the extra work in the garden at home in replacing the fence and repairing the back patio. The idea of grass paths is lovely, and if they were actually grass rather than mixed weeds, we might persevere, but currently the weeds just encroach on the actual beds. Without clearly defined edges keeping the weeds cut as "green" paths without damaging crops is difficult, so .... we are going to use decking boards to edge the beds and landscape membrane to suppress the weeds on the paths. We do need to crack on with this if the polytunnels are also to be erected before the cold weather begins. Talking about cold weather at the beginning of August seems a bit odd, but time does rush by when you are not looking!! 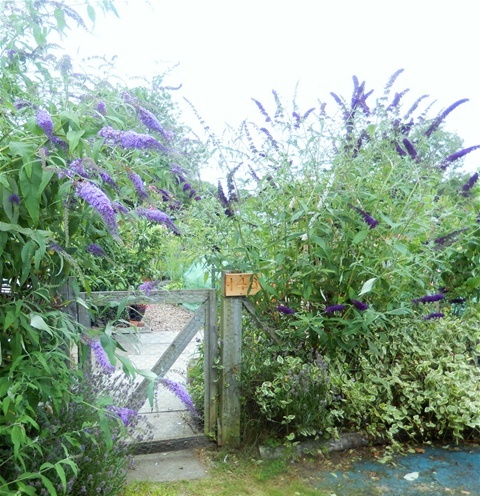 The grass by the two gates will be staying though, as it does look good!! I also took down the pea sticks this morning, cutting up the haulms for the compost bins, leaving three beds empty... waiting in the wings of course are the rest of the leeks, Autumn onion sets, shallots and garlic, as well as the ten broad bean plants for Autumn cropping, a packet of turnip seeds, and some Sweet William seeds saved from this year's plants. Planning ahead is key if we are to eat from the plot throughout the year, and the plants growing from seed sown on 7th July are now planted out into the mini-tunnel. If I can keep the rabbit out of there they might have a chance. I might utilise some of the small pieces of weldmesh to make a brrier across the doorway ....... worth another thought. !st August -- One more step along the road we go! 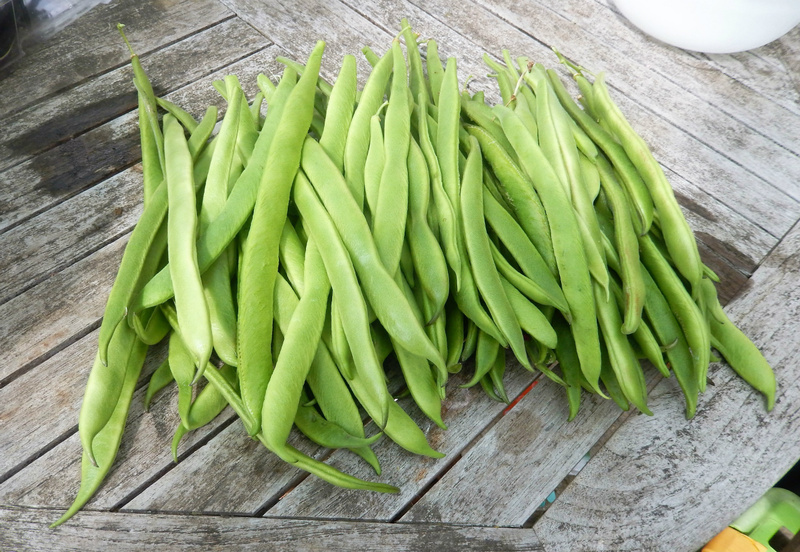 The extra water we have been giving the Runner beans is helping them produce lots of crisp juicy pods, far too many for us to eat, so plenty to share and for the freezer. Benchmaster has been the quickest to crop, and Moonlight the slowest to flower, with Firestorm somewhere in between. 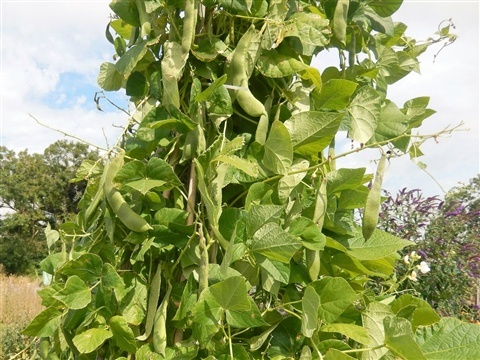 I shall monitor the comparative quality of pods as the season moves on, as last year the Benchmasters seemed to become coarse sooner than white flowered varieties. It'll help wth decisions about what to grow next year. 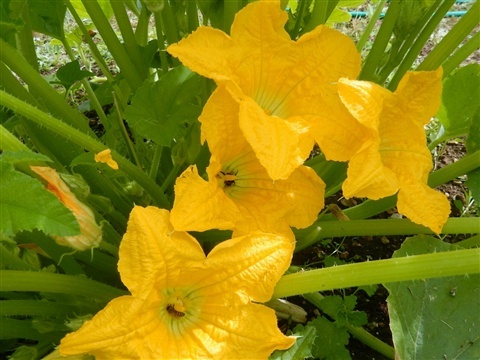 Cucumbers are still madly flowering, and fruits grow quickly, sometimes almost too quickly. 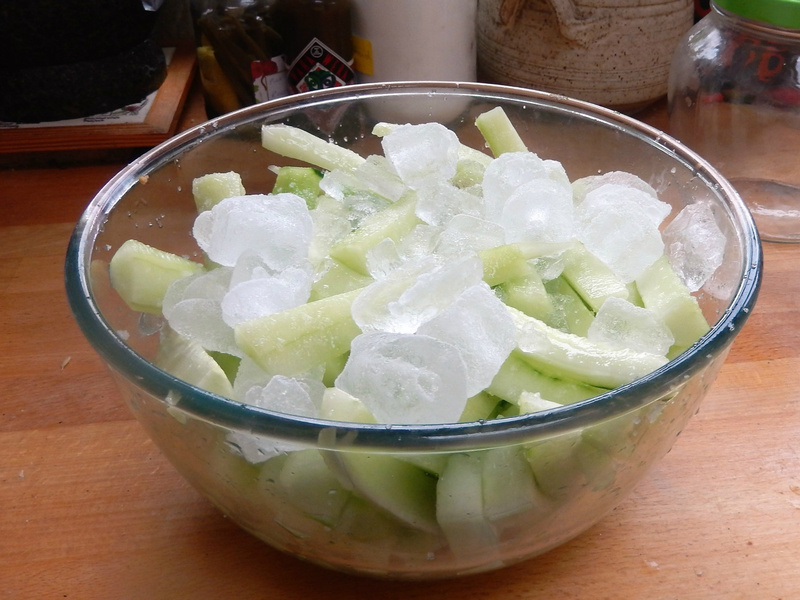 This week I have not had much time for pickling, as we have hosted a couple of celebratory meals (Look out for the paella recipe to be posted soon) and there are now several cucumbers in the fridge ready to be turned into diil pickles, along with a fair few courgettes with an as yet undecided fate! 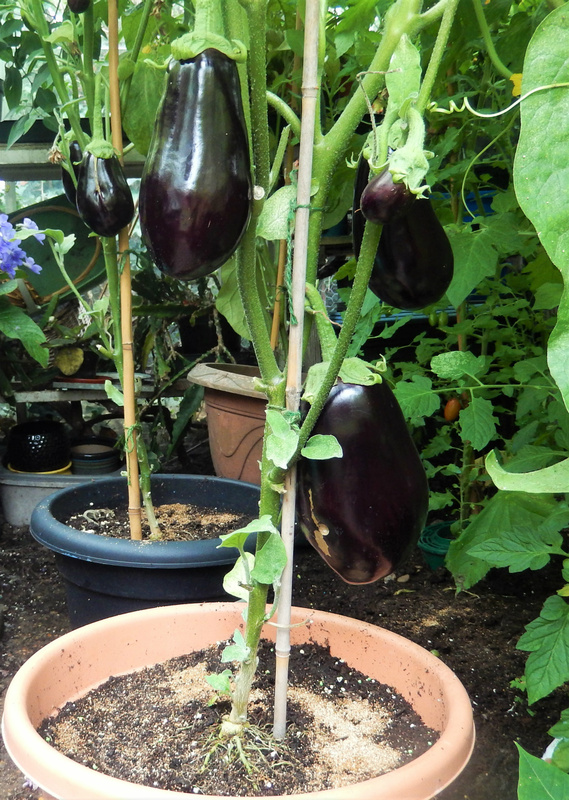 The grafted Scorpio aubergine plants are full of fruit, and our youngest granddaughter Rowan described the greenhouse at home as an "Aubergine jungle" this morning. She is three years old and the plants tower over her, so I could see what she meant! 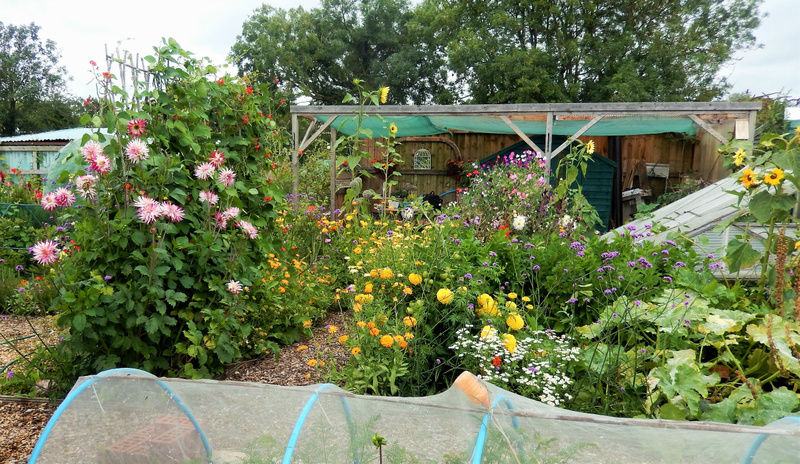 The Black Beauty plants in the mini-tunnel at the allotment are setting more fruit than those in the greenhouse though, which is a bit of puzzle. It may be because they are on the staging and get hotter than the huge plants that are standing on the floor shaded by cucumbers. Those in the mini-tunnel are shaded by the tomato plants... must think about where they are to grow next year as wihout fruit they are not worth the space they take up, which could be more profitably used by more chillies, or by sweet peppers perhaps. 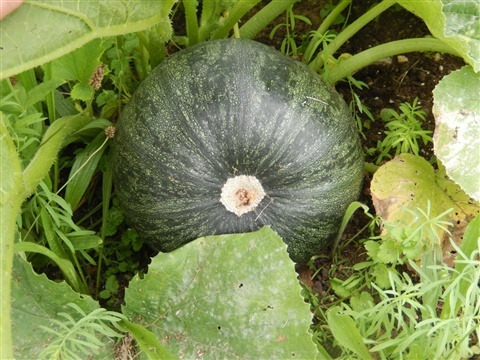 After a really dodgy start, the squashes are looking more promising. Again, it is due to the extra water they have had during the long dry spell. In my haste to get the second sowing in the ground I misplaced the labels so it'll take time to work out which is which. Silly really, but there we are! Remember he ate the shoots of the chickpea plants? 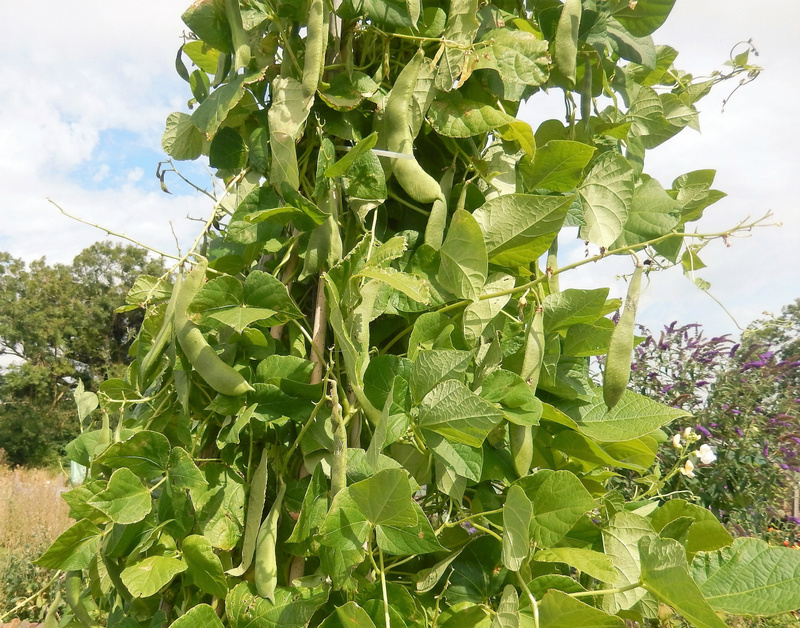 Well one tiny shoot escaped his notice and now has nice fat pods, showing us how plentiful a crop we might have had sans rabbit. Looks like it might be worth another try next year!! 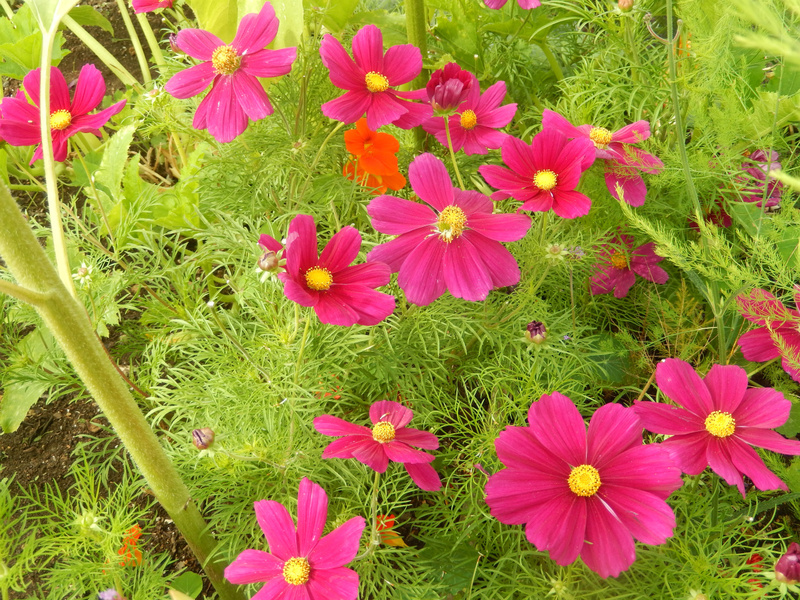 And to finish, here are the Cosmos, which are planted at the edge of the courgette plants, giving a brilliant splash of colour. Hope they self seed! !